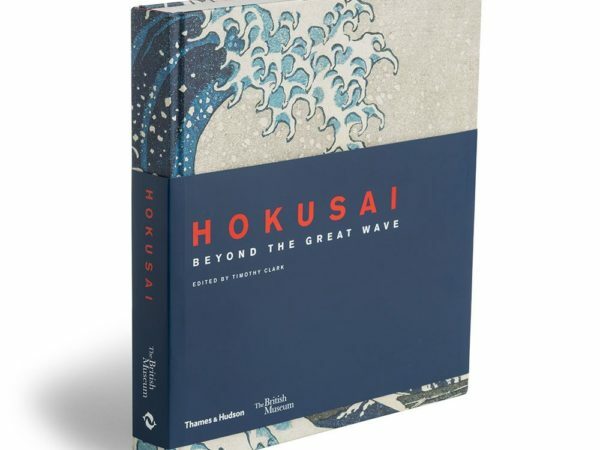 Katsushika Hokusai (1760-1849) and Utagawa Hiroshige (1797-1858) are two of Japan’s best-known woodblock print artists. 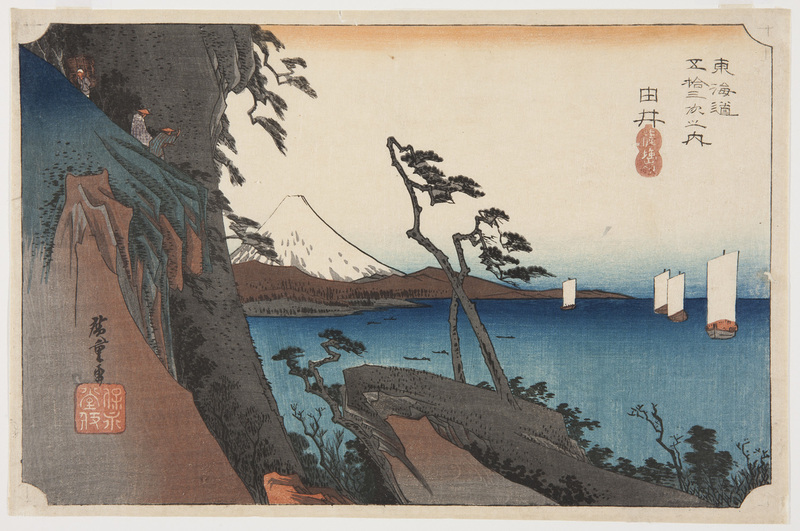 In the 1830s they designed new series of prints depicting landscapes, using a horizontal format. 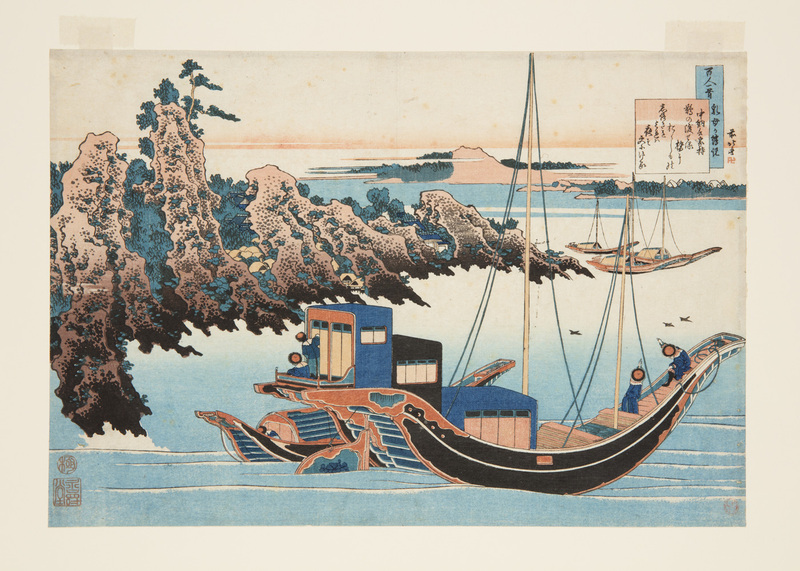 These became hugely popular with their customers in Japan and later with western artists and collectors. 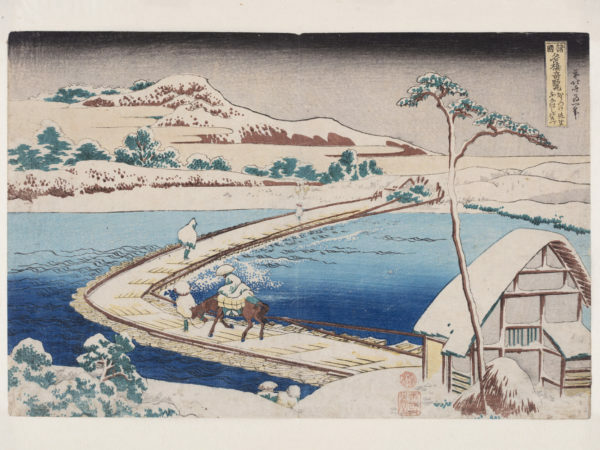 Both Hokusai and Hiroshige used innovative perspectives, changes in light and weather as well as human activity to involve viewers in their landscape designs. 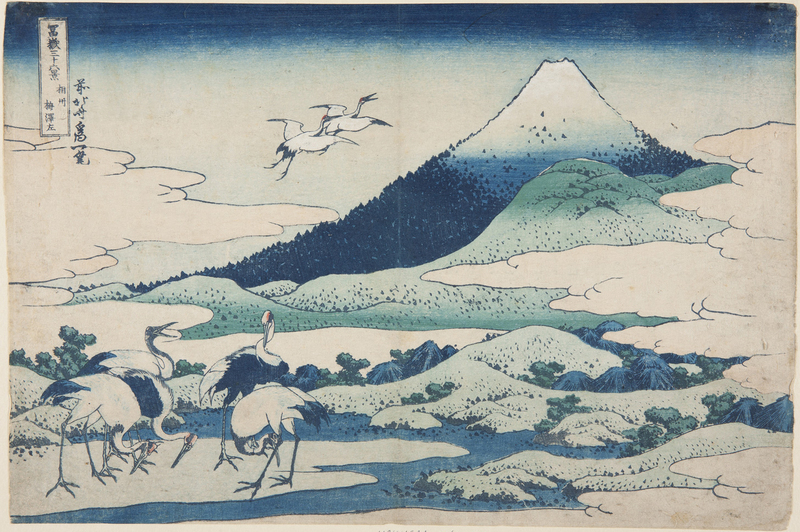 The Masters of Japanese Prints: Hokusai and Hiroshige landscapes exhibition was open at Bristol Museum & Art Gallery from 22 September 2018 – 6 January 2019. 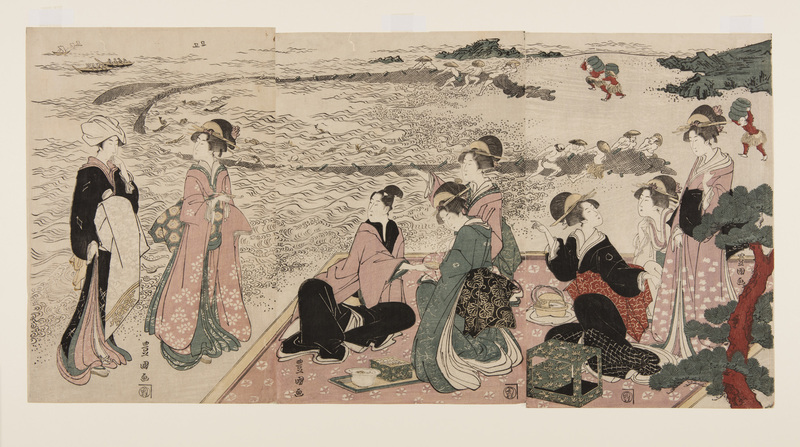 The second exhibition in the series, Masters of Japanese prints: Life in the city runs from 12 January – 12 May 2019. 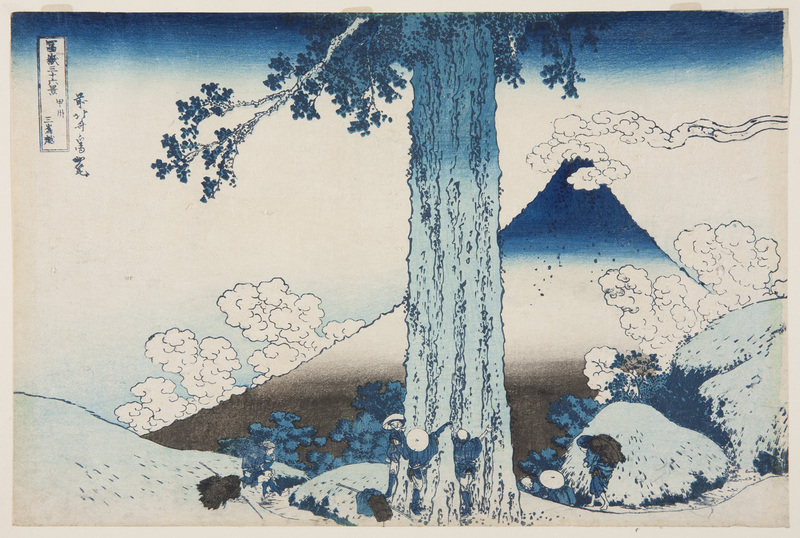 The third exhibition, Masters of Japanese Prints: Nature and seasons runs from 18 May – 8 September 2019. 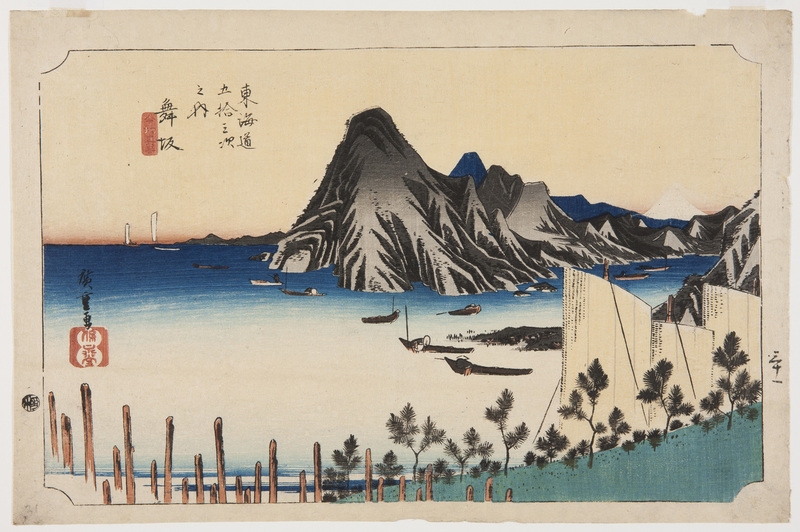 Chinese artists were the first to depict landscapes as the main subjects of their paintings. 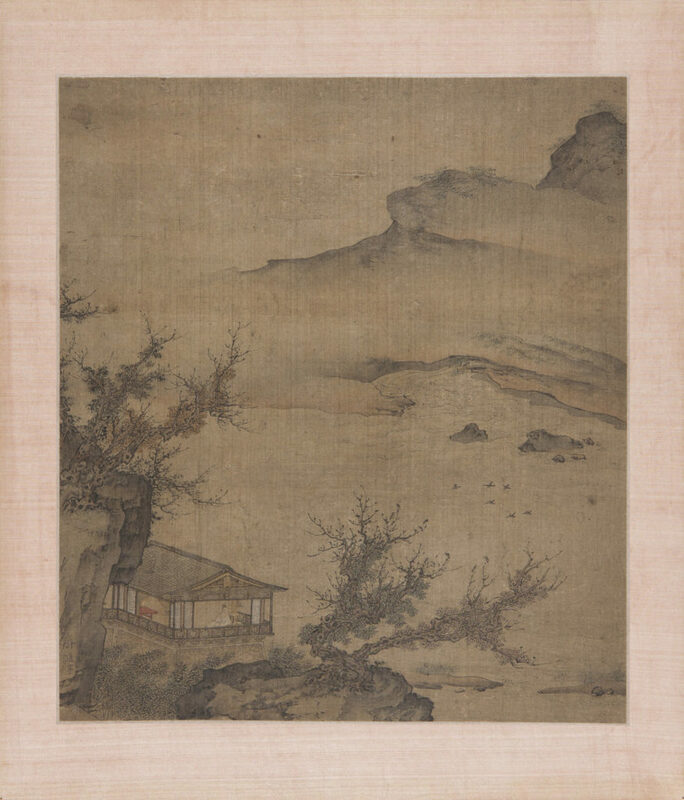 This painting is in the style of Xu Daoning, a Chinese painter of the Northern Song dynasty (AD 907–1127). 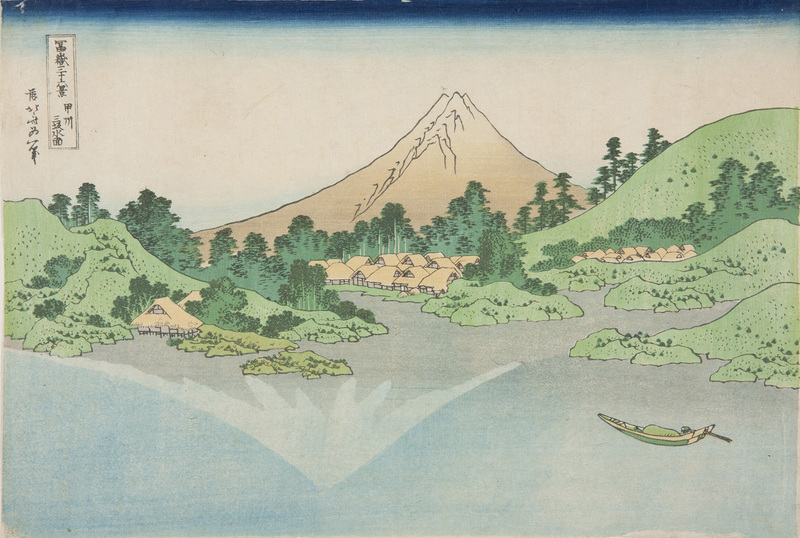 The black ink is diluted thinly in places to show the delicate features of the land and water. 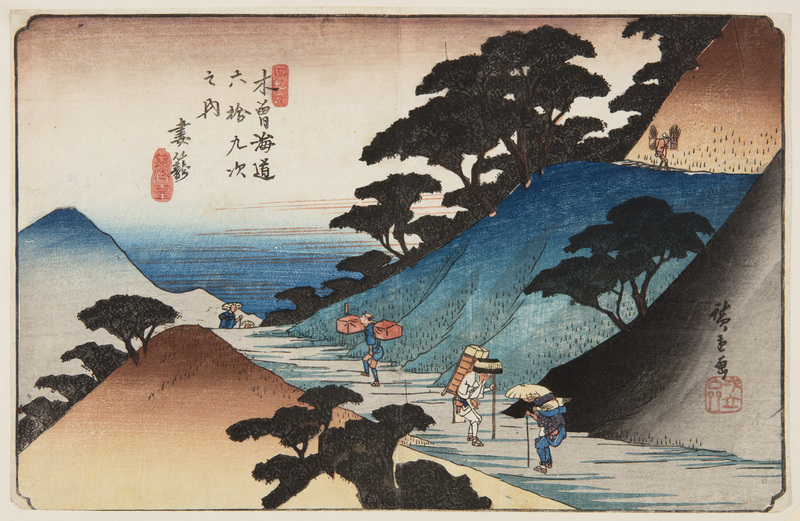 In Japan, Chinese-style landscape paintings first became popular about 600 years ago. 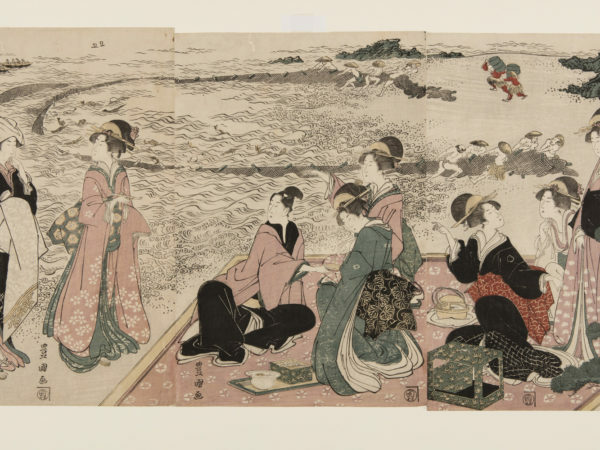 Toyokuni was one of the first Japanese artists to include complex landscapes in his woodblock print designs, often as backgrounds to scenes of fashionable people. As a young man, the artist Hiroshige asked to be Toyokuni’s pupil but was turned down, apparently as Toyokuni already had too many students. 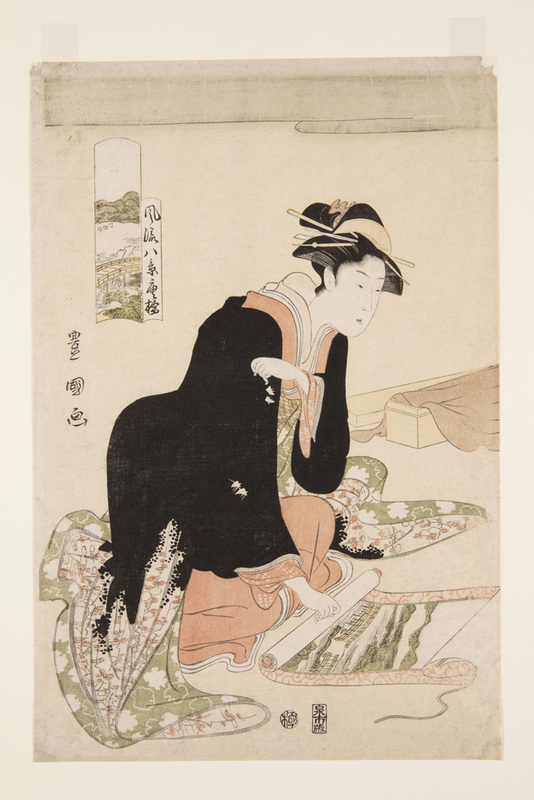 This woman with her elegantly layered gown (kimono) is rolling up a scroll painting with a landscape view. Behind her on the right, there is a box and soft cloth to store it in. 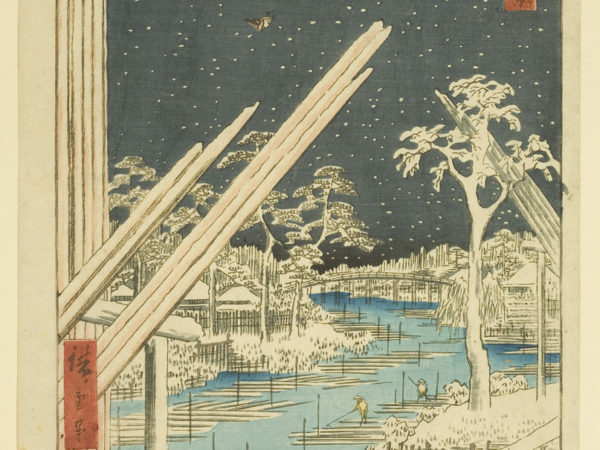 Vertical scroll paintings like this might be hung up in special display areas (tokonoma) in Japanese houses and changed according to the seasons. 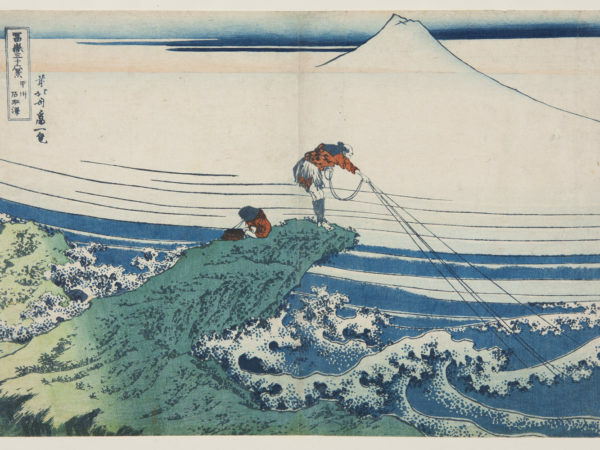 Hokusai was the first woodblock artist to make landscape the main focus of his colour prints. 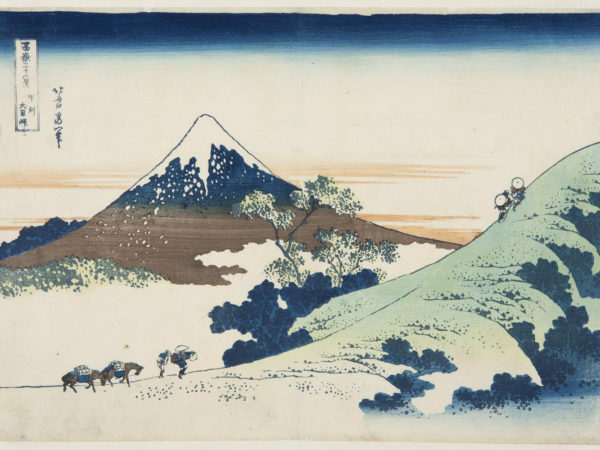 In his ground-breaking series Thirty-six Views of Mount Fuji (1830-31), he depicted the volcanic cone of Japan’s tallest mountain, Fuji, from a range of different view-points and at different times of day. 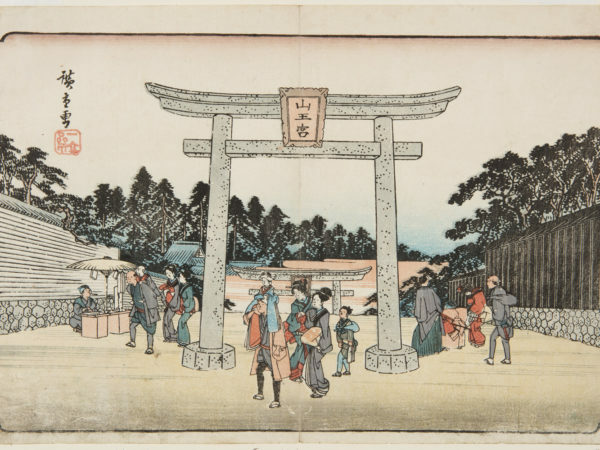 Many customers bought these works and scholars estimate that each design was printed as many as 8,000 times to satisfy demand. At this time Japanese people were increasingly interested in travel and visiting famous sites. 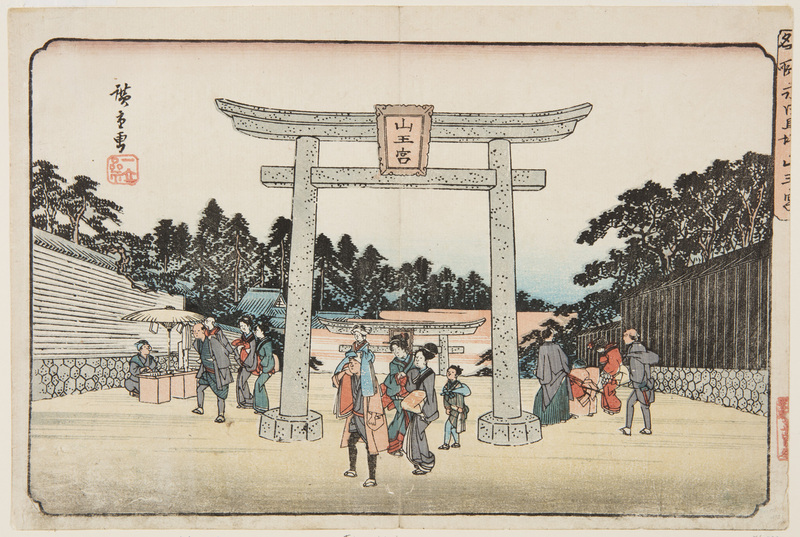 They could buy woodblock prints as attractive souvenirs for the same price as a large meal. 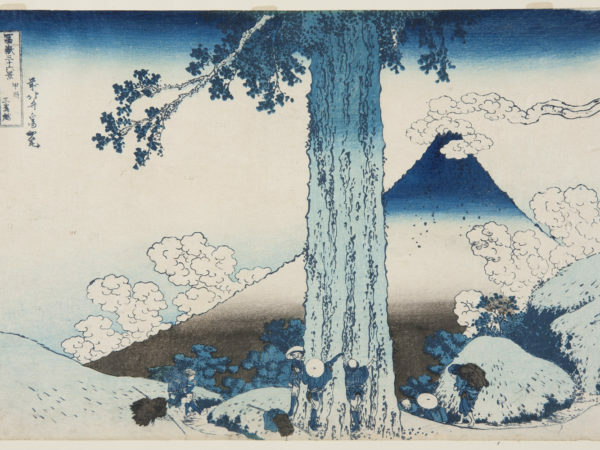 Around 1800 Katsushika Hokusai began to experiment with horizontal landscape designs. Perhaps he was inspired by the wide views that are seen out of rooms in traditional Japanese buildings, where sliding walls open straight out onto verandas and gardens. 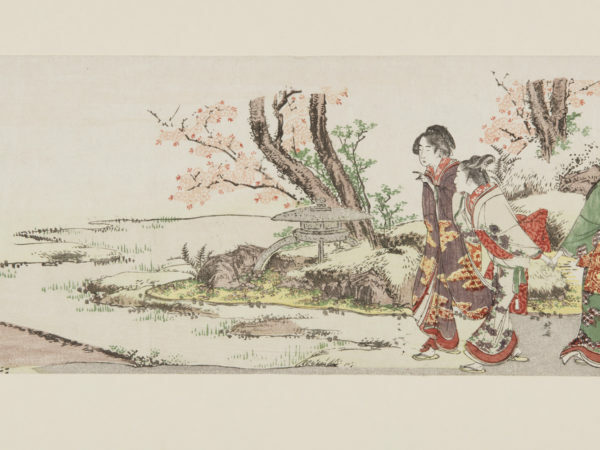 In a Japanese myth, husband and wife Jō and Uba lived a long and contented life together. They represent faithfulness and happiness in marriage. 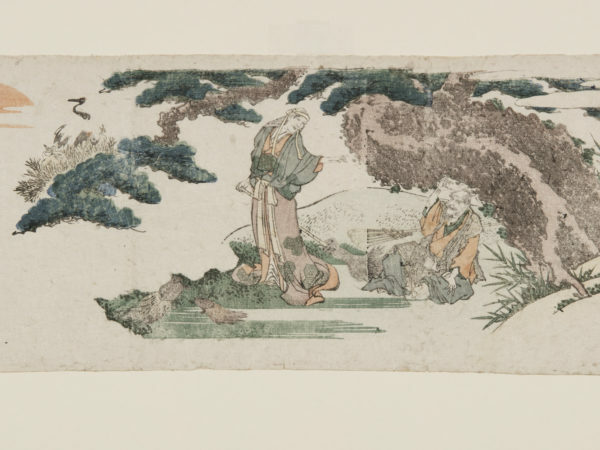 Several symbols of long life are depicted here: a pine tree, cranes and turtles so old they have gathered long tails of seaweed on their shells. 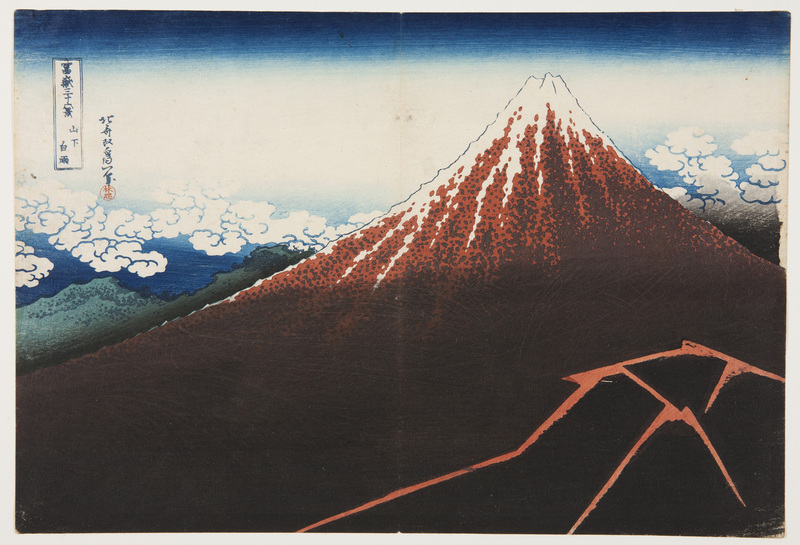 from the series Thirty-six Views of Mount Fuji. 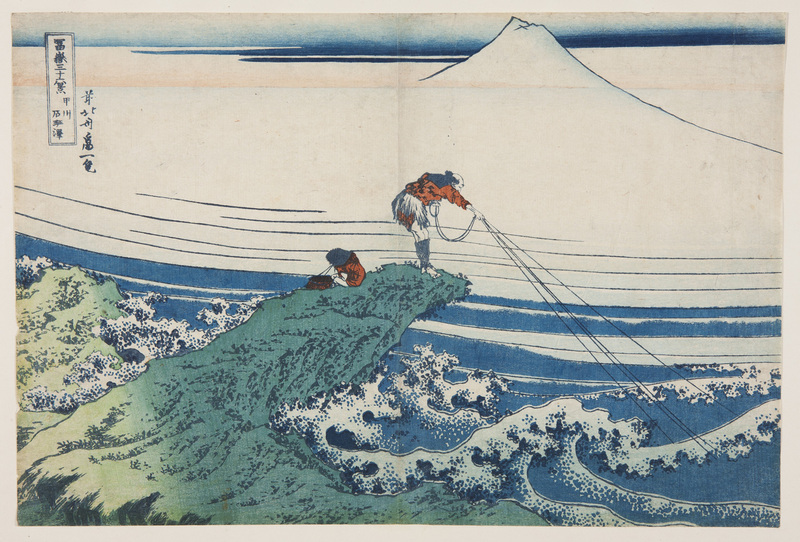 This dramatic wave dwarfs the fishermen in their boats and Mount Fuji in the distance. 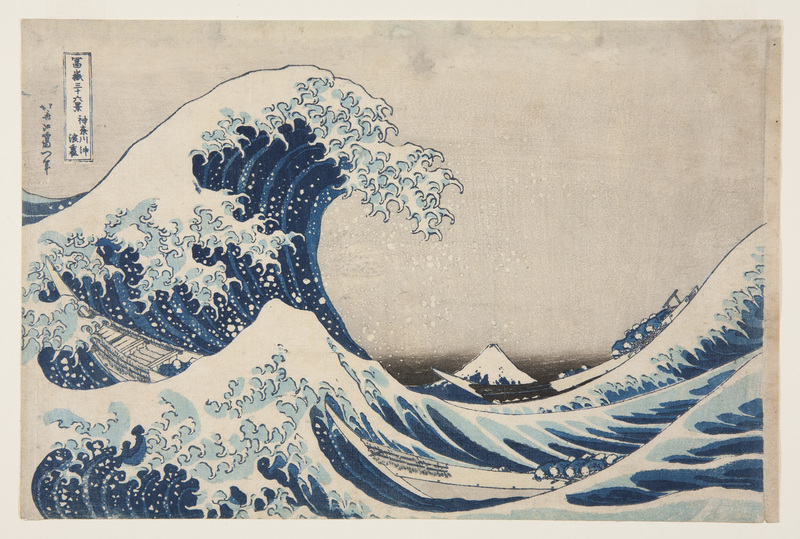 Art historians have pointed out that the wave’s white crest looks almost alive with grasping claws. Notice how the shape of another wave mirrors that of the mountain. Mount Fuji dominates this dramatic view and there is no sign of human activity. 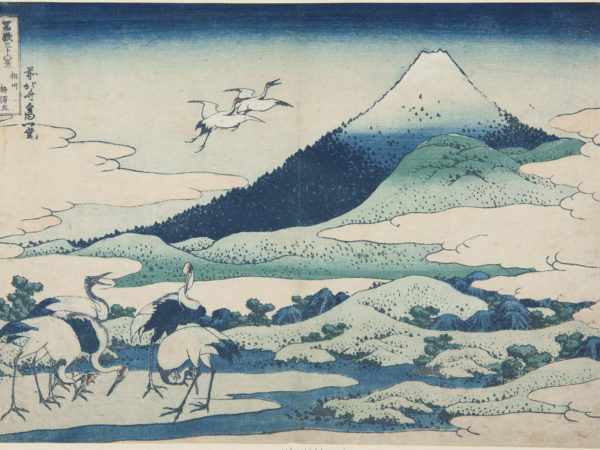 The setting sun falls on the peak of the mountain whilst a summer storm flashes on its lower slopes. 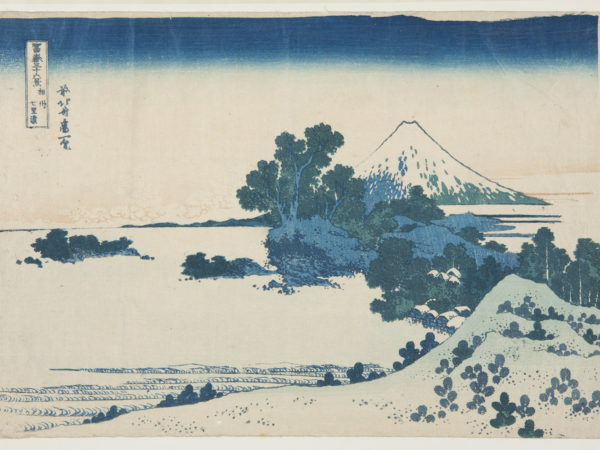 The printer has applied blue ink onto the block for the sky, wiping some away again, a technique known in Japanese as bokashi. 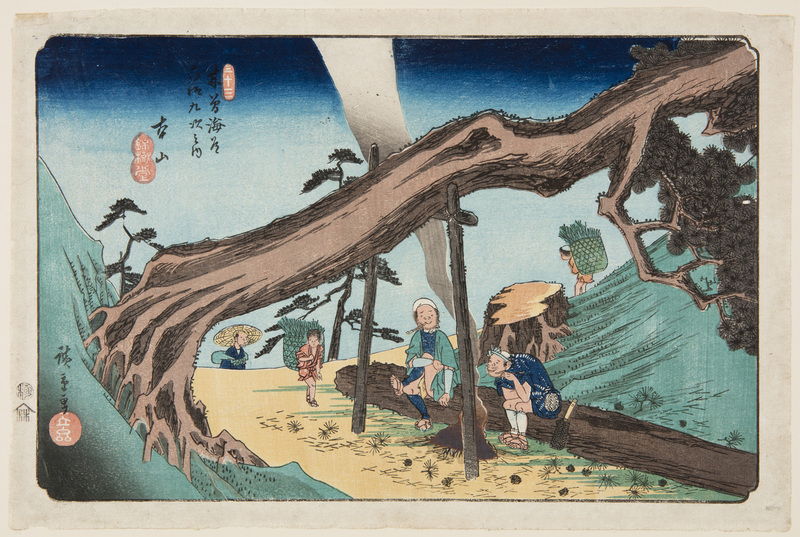 Three men measure the huge trunk of a tree with their outstretched arms. 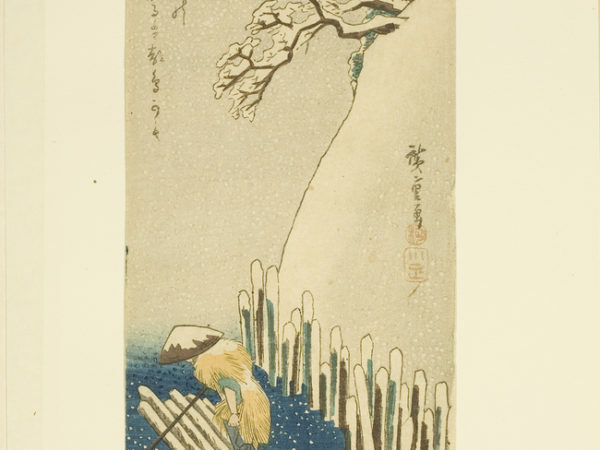 Hokusai has placed the tree almost centrally in the design, whereas a western artist at the time would probably have put it further to one side. 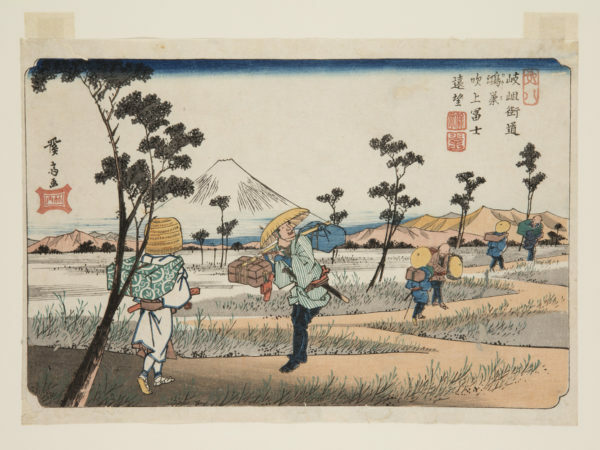 Later on western artists, such as Van Gogh and Gauguin, were strongly influenced by the compositions of Japanese prints. 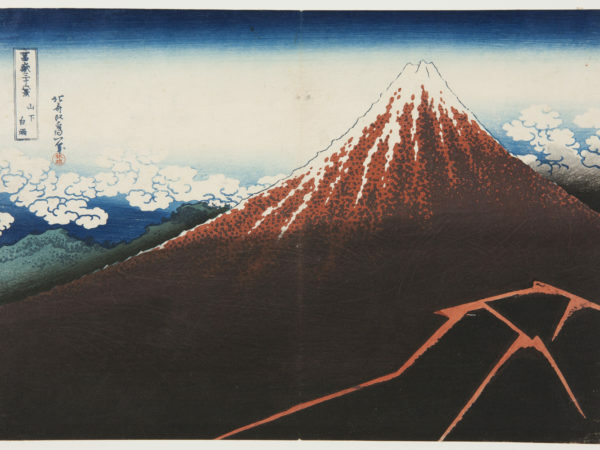 Mount Fuji is depicted by Hokusai in a few, simple brush strokes. 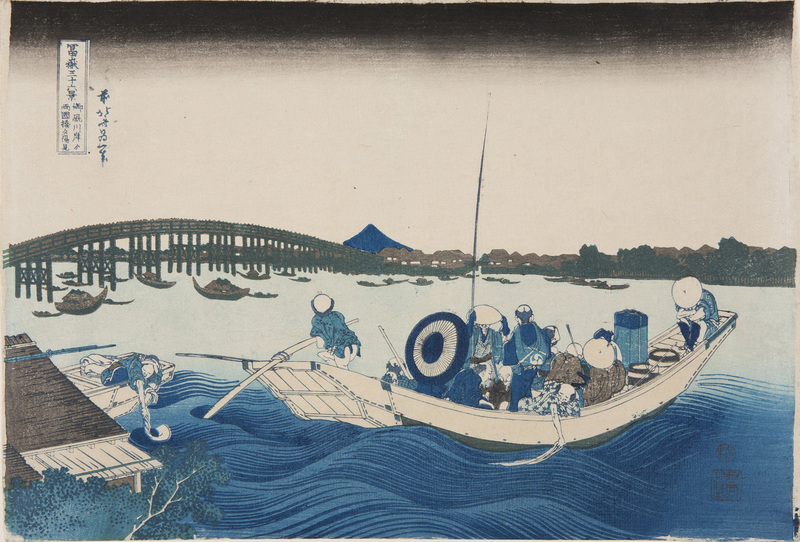 These are mirrored by the shape of the fisherman’s lines, as he pulls back against the force of the rushing river. 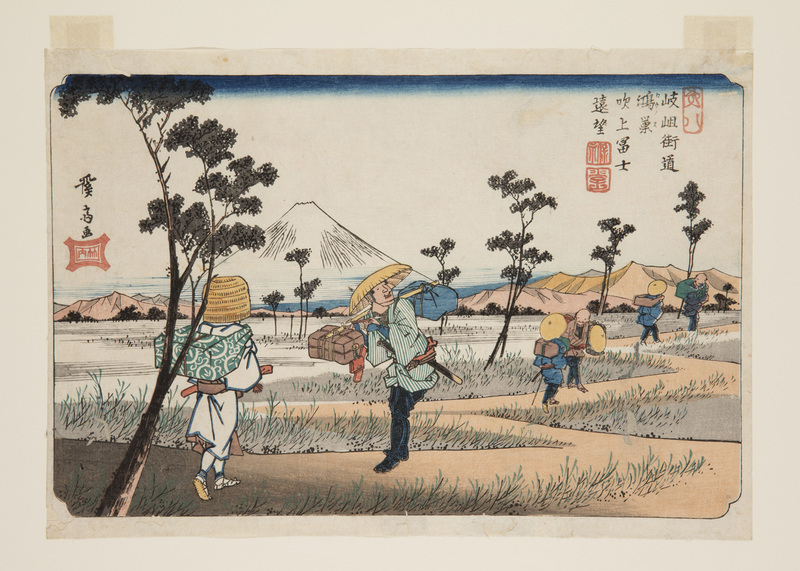 Travellers labour up a slope adjacent to Mount Fuji. 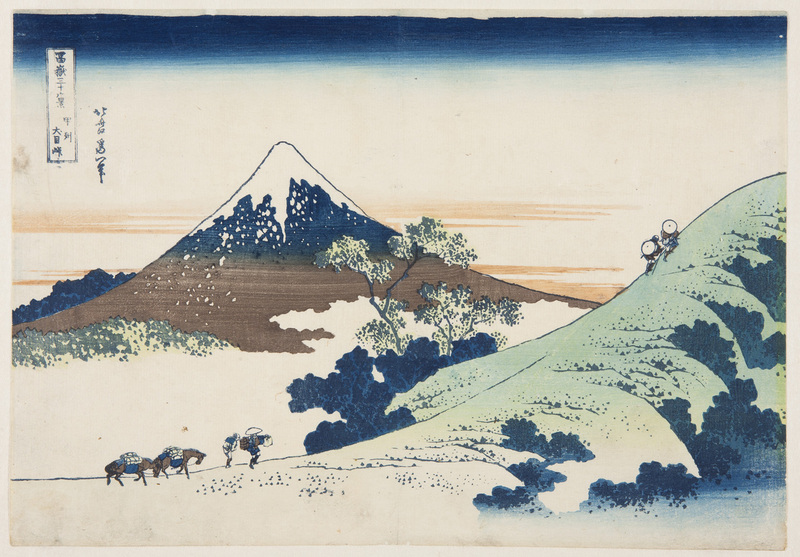 As the pair of men at the top turn towards the great mountain, we follow their gaze. 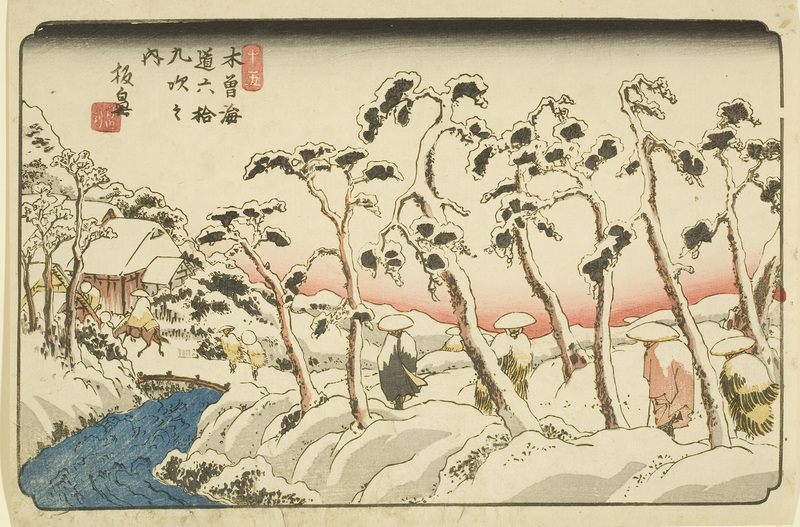 The subtle red streaks in the sky suggest that it is early morning. 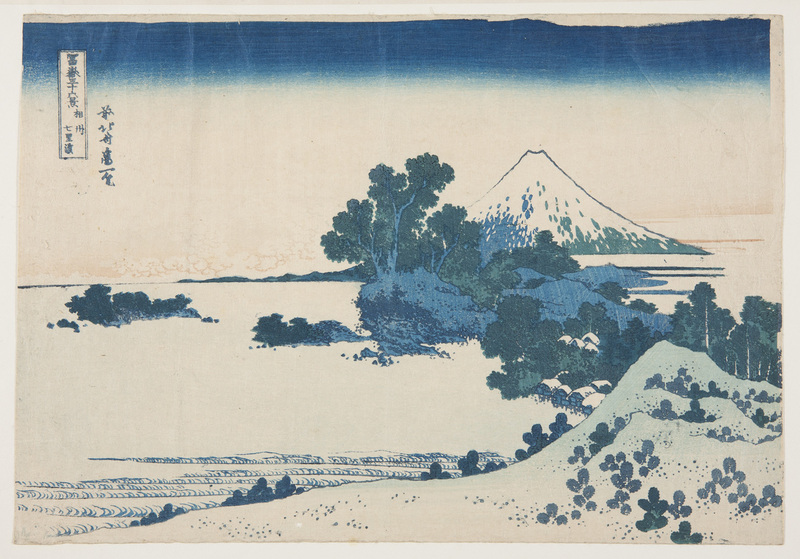 Hokusai often used strong diagonal lines in his landscapes to suggest depth and distance. Here the boat on the Jewel River looks as if it is about to float through the low clouds towards Mount Fuji. 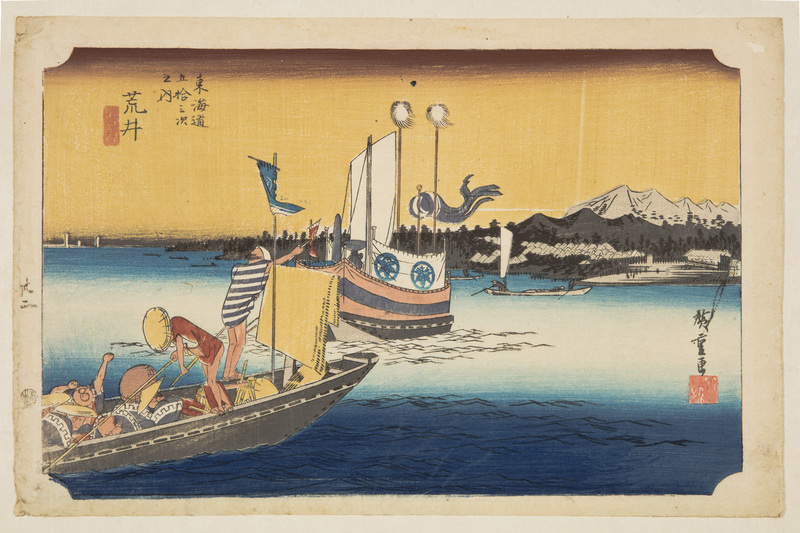 From a high point on the shore, we see inside a boat where the crew are getting ready in the early morning. 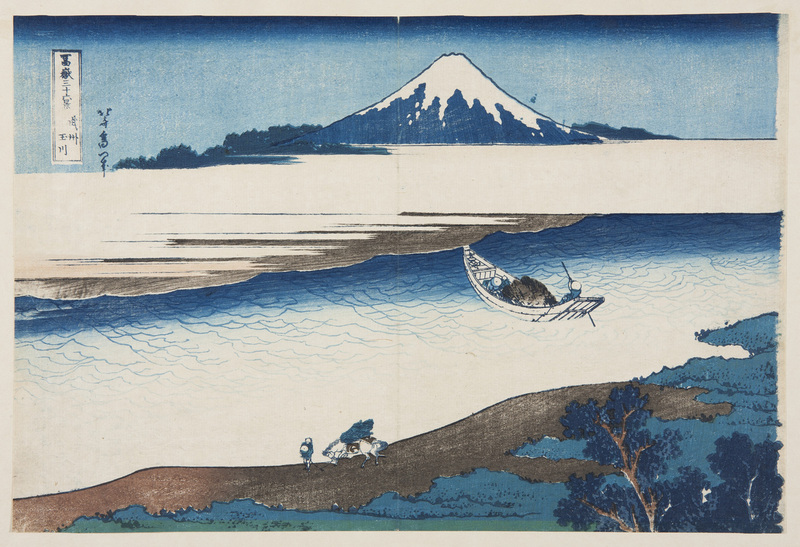 Hokusai sometimes put parts of large objects in the foreground of his landscapes, like the boat here, making the viewer feel closer to the scene. From the group of cr anes on the left, our eyes are drawn across hillocks and morning mist to Mount Fuji. In Japan cranes are considered lucky, as legends say that they live for 1,000 years. 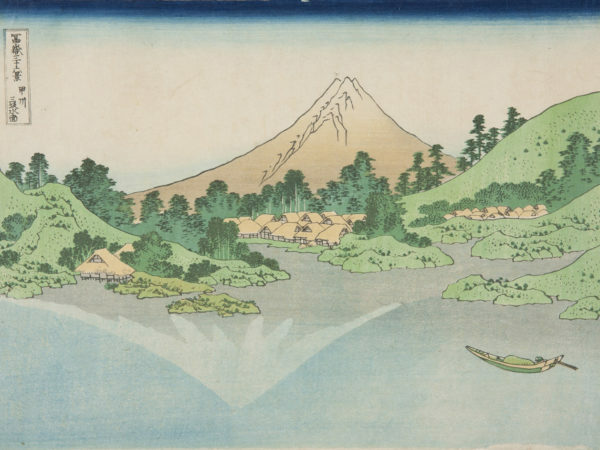 The snowy summit of Mount Fuji is reflected in the still water of Lake Misaka. The reflection is off-set and does not match exactly so we have to look more closely. 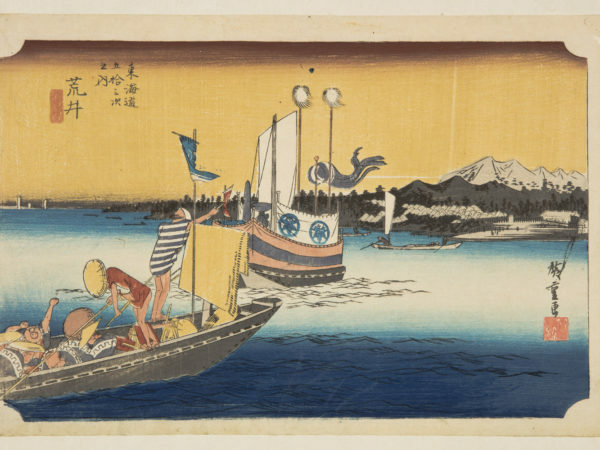 Under a darkening sky, ferry passengers crossing the Sumida River look towards Mount Fuji. 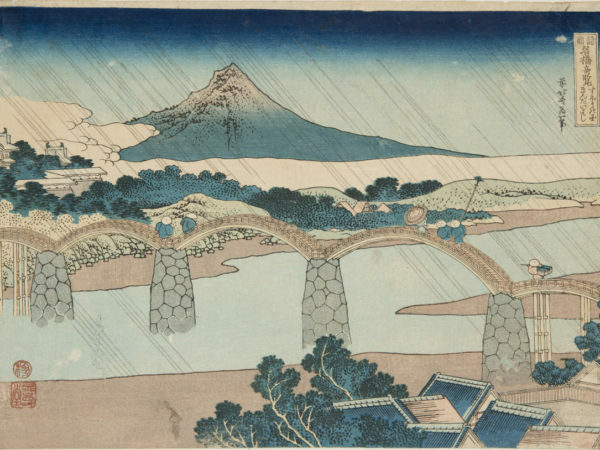 On the left, one of the city of Edo’s (Tokyo’s) famous wooden bridges seems to lead directly to the mountain. In this view we can see the waves rolling in towards Seven-Mile Beach near Edo (Tokyo). 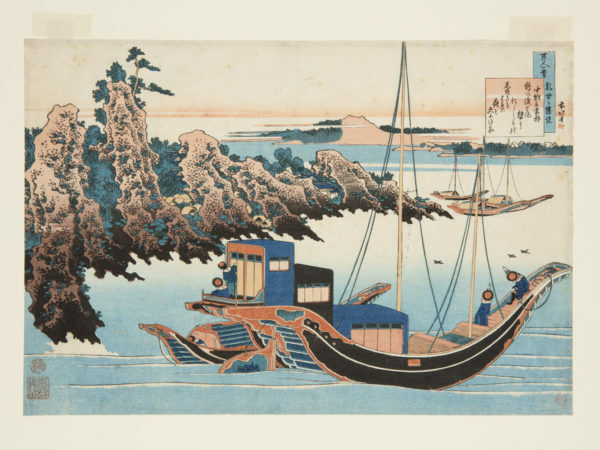 The design shows Hokusai experimenting with the possibilities of ‘Prussian blue’, a chemical ink, imported into Japan from Europe from the 1820s. 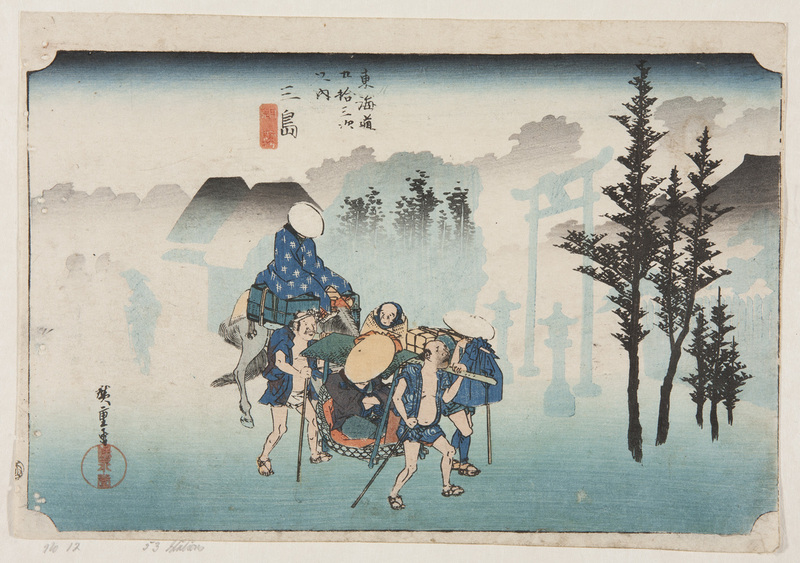 Prints like this were called aizuri-e (blue-printed pictures). 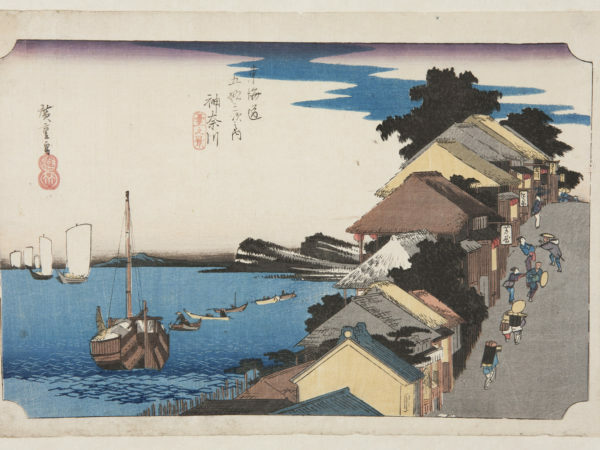 Fishermen and their families lived on Tsukuda-jima, an island near the mouth of the Sumida River that flowed through the city of Edo (today’s Tokyo). 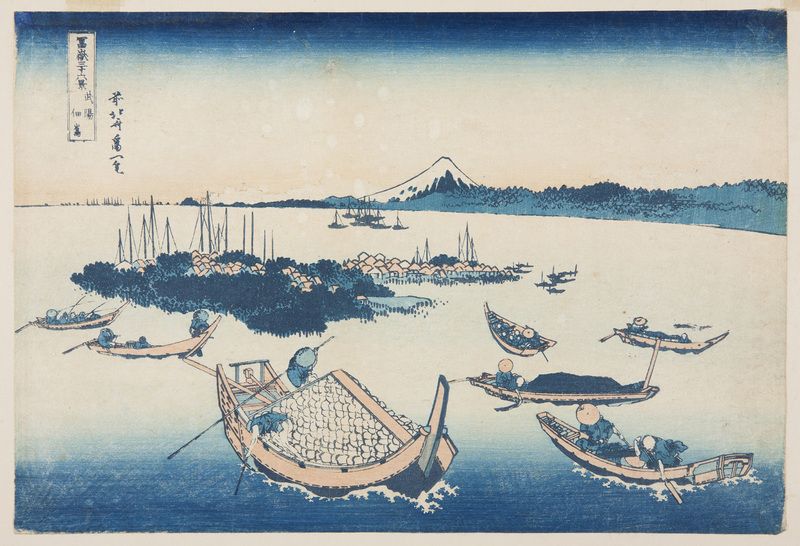 Here Hokusai suggests perspective and distance through the diminishing size of the boats. This temple to the east of Edo (Tokyo) contained 500 life-size sculptures of the Buddha’s closest followers (arhats). 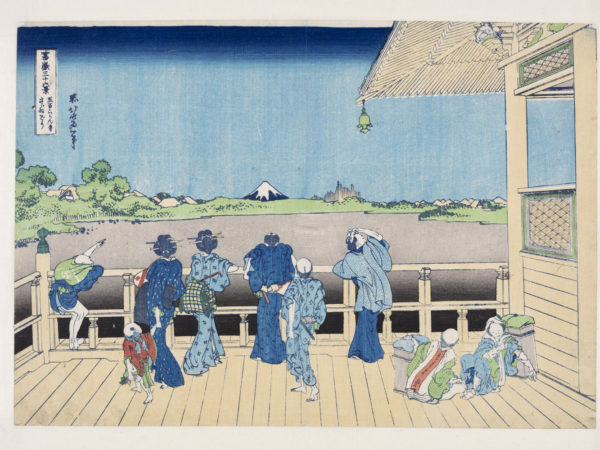 Pilgrims visiting the temple to pray also got a good view of the city and Mount Fuji from the upper storeys of the wooden building. The lines of the planks on the balcony focus our eyes towards the mountain. 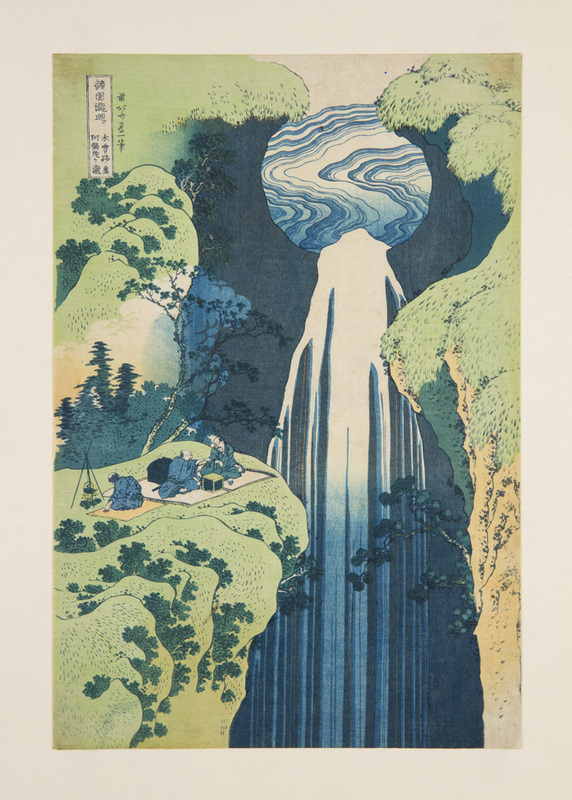 from the series Tour of Waterfalls in Various Provinces. 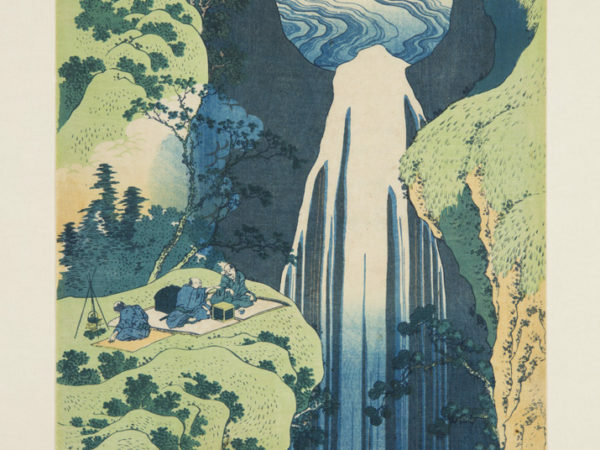 In this striking composition, Hokusai contrasts the rippling pool at the top of the waterfall with the columns of water crashing downwards. 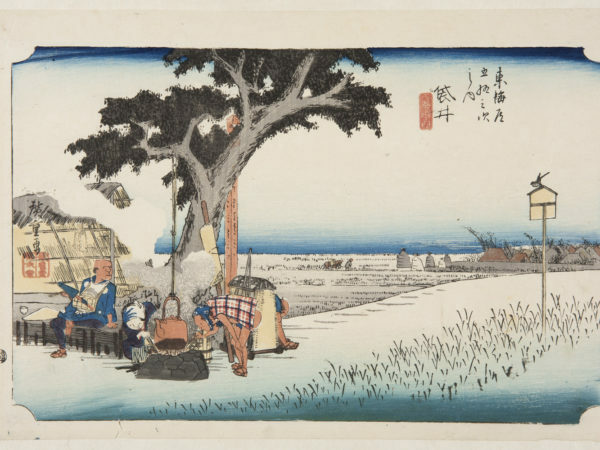 The picnickers on the bank look as if they have chosen a dangerous spot to rest but they seem quite relaxed, warming their sake (rice wine). 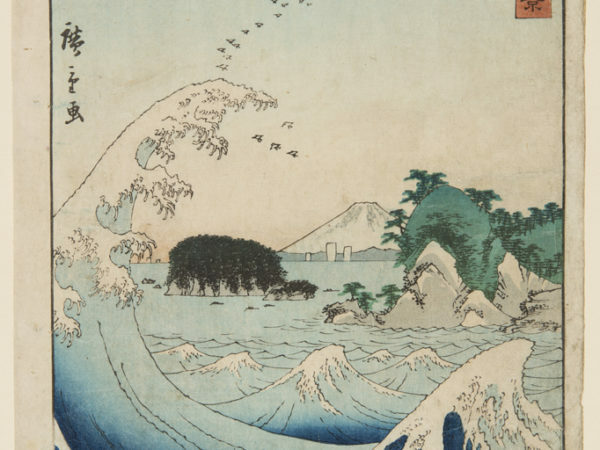 The turns of the river rushing towards us create a sense of depth in the image. 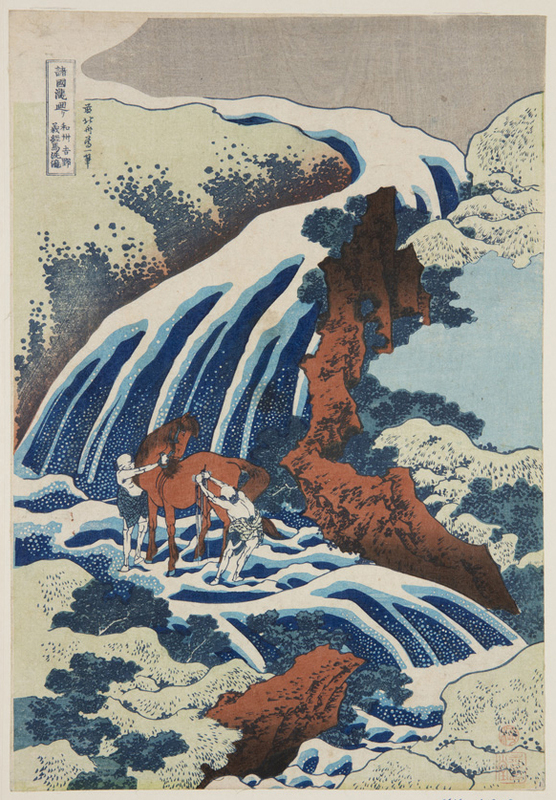 The name comes from a legend that said that a hero in Japanese history, Yoshitsune (AD 1159-1189), had stopped at this waterfall to wash his horse. 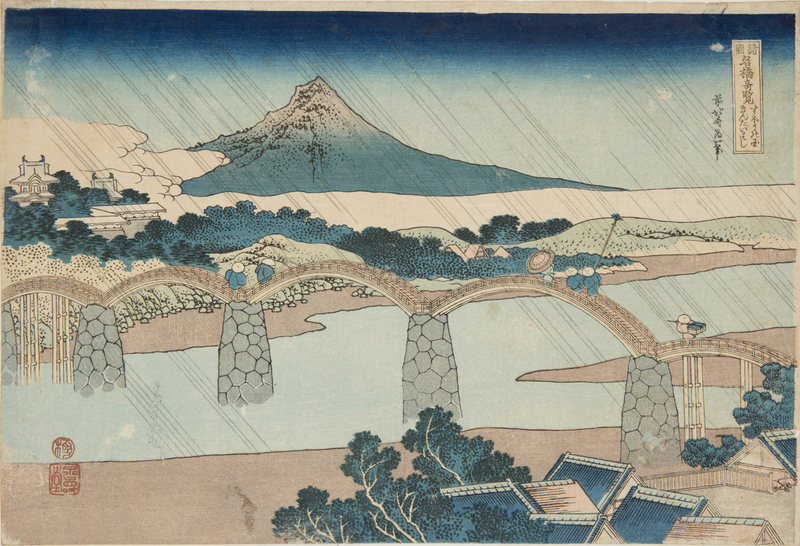 from the series Remarkable Views of Bridges in Various Provinces. It was a well-known landmark, built of stone and wood in 1673 at the order of a local lord. 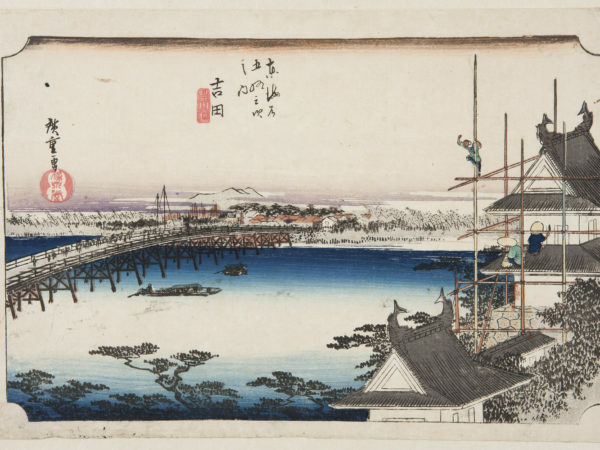 This unusual bridge is constructed of planks of wood laid over a line of boats permanently moored together. 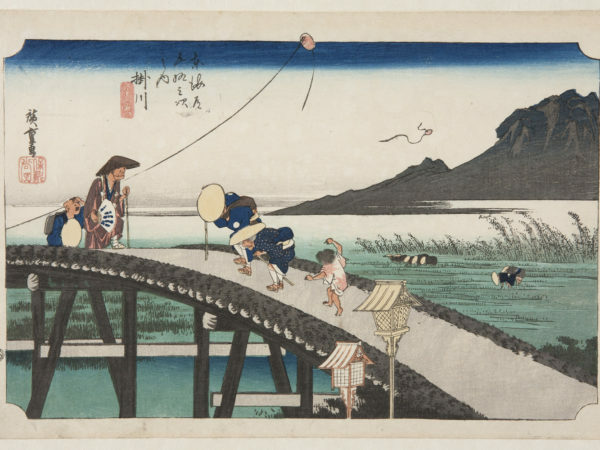 Hokusai invites us to follow the strong diagonal lines of the bridge as if we are the travellers. 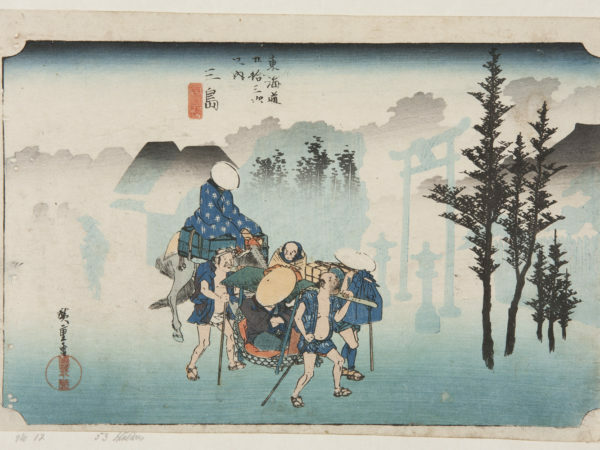 from the series One Hundred Poems Explained by the Nurse. And I knew the dawn was at hand. 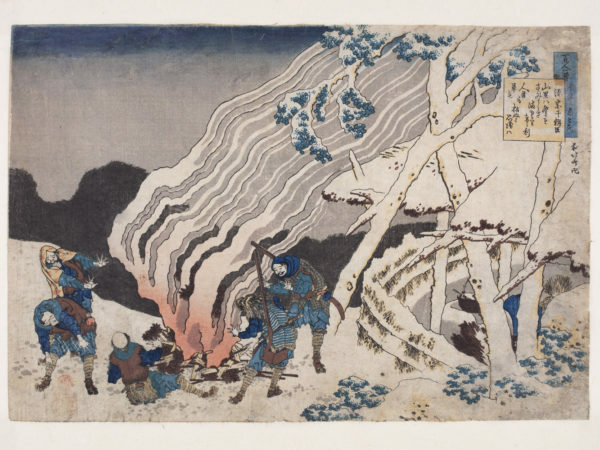 The poem sounds melancholy but the men around the fire seem to be quite happy. In the foreground servants relax and chat after a hard day. 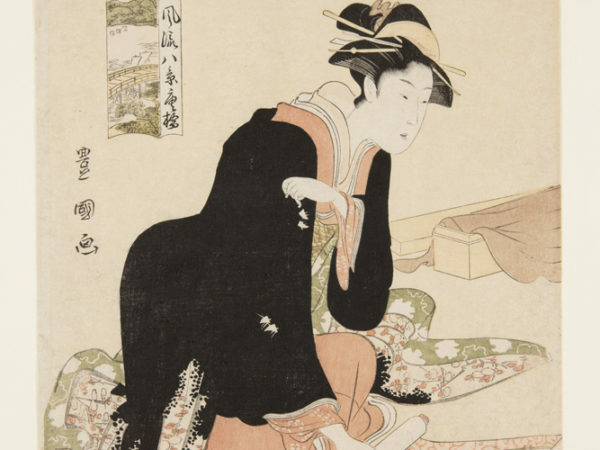 In contrast their master sits apart contemplating the view, attended by a maid. So the love that fills my thoughts. 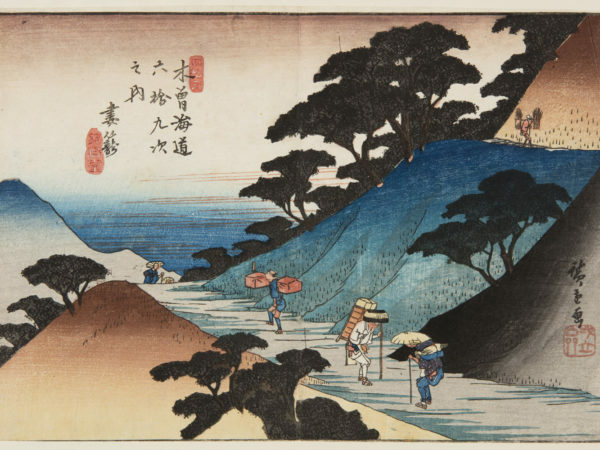 Encouraged by Hokusai’s success, Hiroshige developed his own landscape series starting with The Fifty-three Stations of the Tōkaidō Road (1833-34) which portrayed stopping places along the coastal road between the cities of Kyoto and Edo (today’s Tokyo). The Tōkaidō Road and the Kisokaidō Road, the inland route depicted in a later series, were heavily used by travellers including powerful lords (daimyo) and their followers who had to travel regularly to Edo to show their allegiance to the Shōgun, Japan’s military dictator. 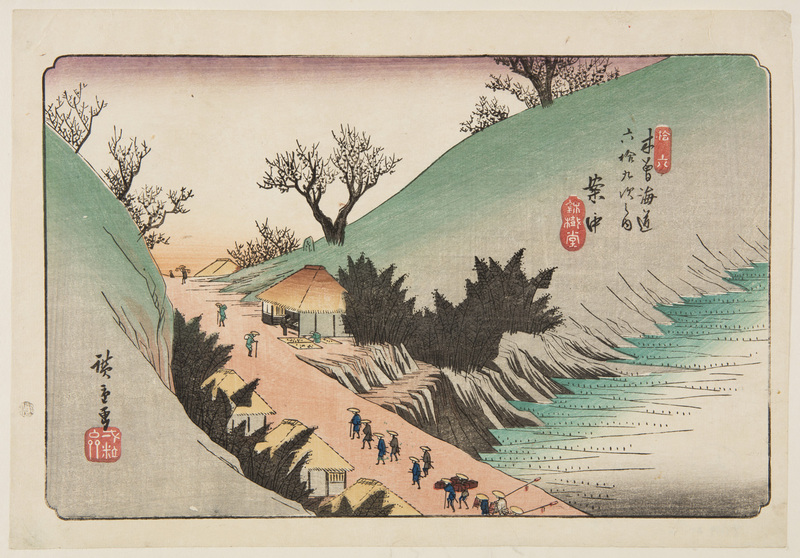 Hiroshige uses inventive view-points for his landscapes, zooming between mountain ranges and roadside shacks. He shows people experiencing all the physical aspects of travel ranging from a hard climb through snow to a rest with a cup of tea. 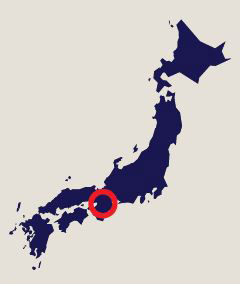 This is the archway or torii of Sannō Shrine, a place of worship for followers of Shinto, Japan’s native religion. 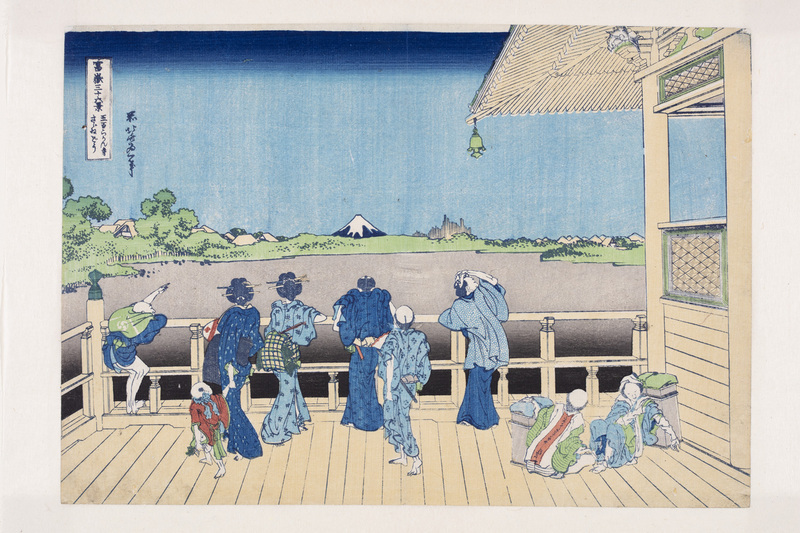 In Hiroshige’s design the side walls slant inwards towards a vanishing point in the centre of the image, following western conventions of perspective. 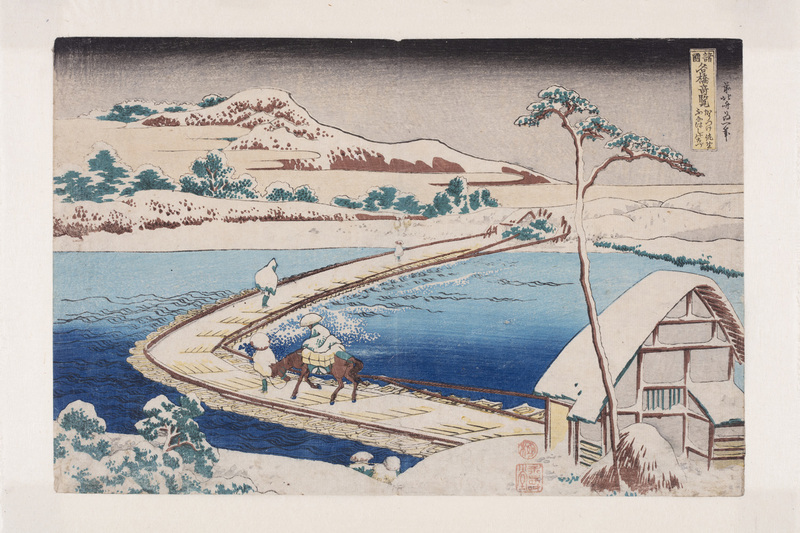 At this time, Hiroshige was one of the few Japanese artists experimenting with western composition. 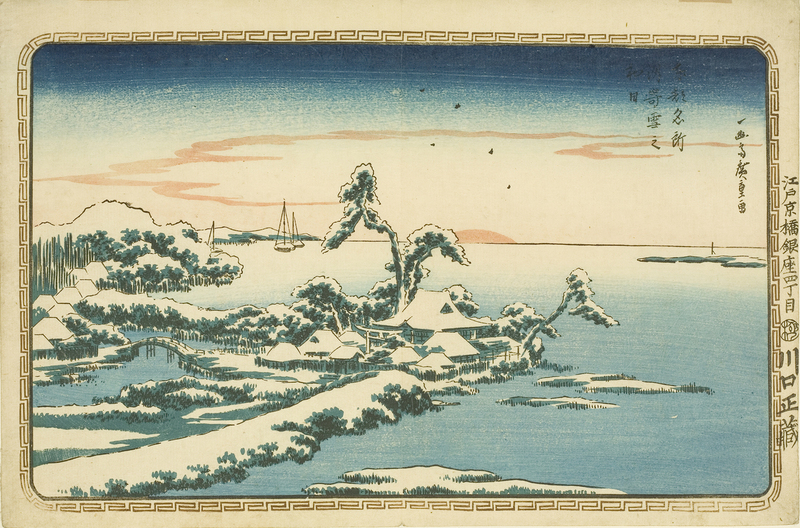 This is one of Hiroshige’s earliest landscape prints. He made his name with views of Edo (Tokyo), also known as the Eastern Capital. Susaki, to the south of Edo, was a favourite spot for watching the sun rise. 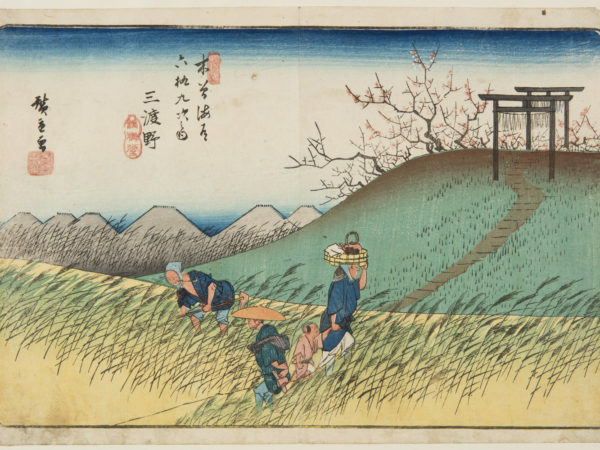 Hiroshige has included a brown border, probably to resemble the frame on a western print. 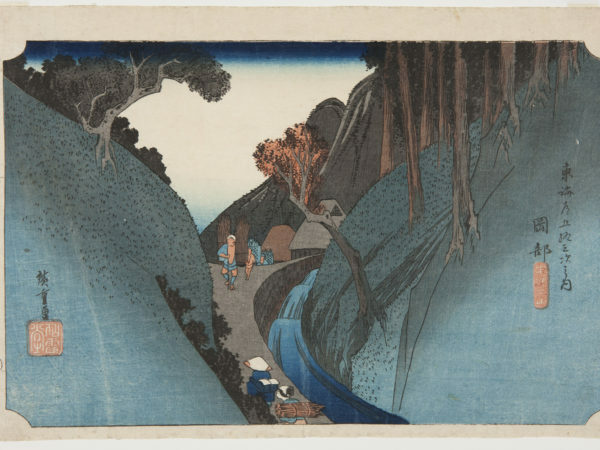 from the series The Fifty-three Stations of the Tōkaidō Road. 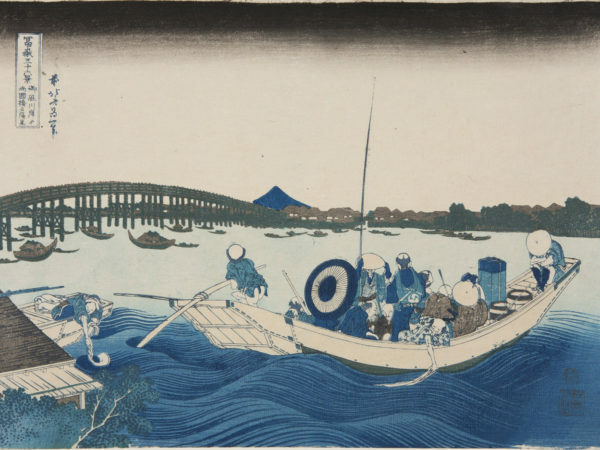 In this famous series of prints, Hiroshige depicted the stopping places on the Tōkaidō or ‘eastern sea route’ that followed the coast between the capital city Edo (today’s Tokyo) and the former capital, Kyoto. 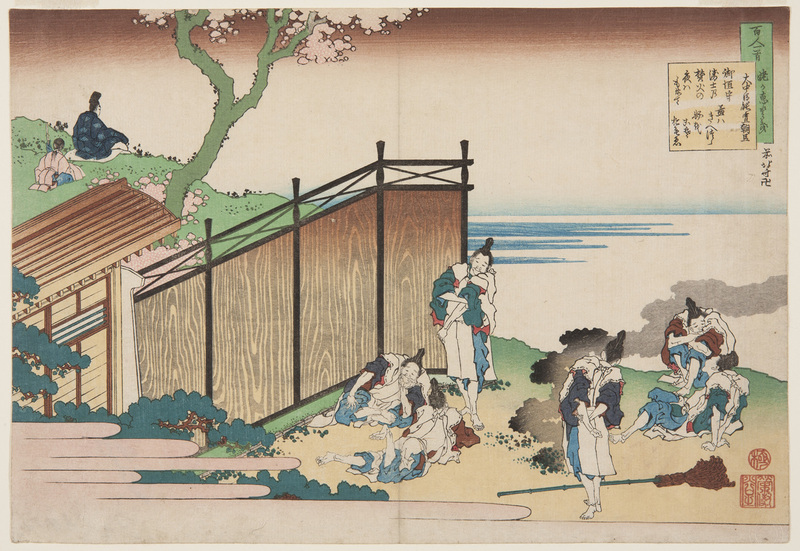 Some scholars believe that the artist actually travelled from Edo to Kyoto and back in about 1832 and that this inspired the series of prints. Waitresses from the tea houses at Kanagawa near Edo (Tokyo) encourage travellers to come in for refreshment. 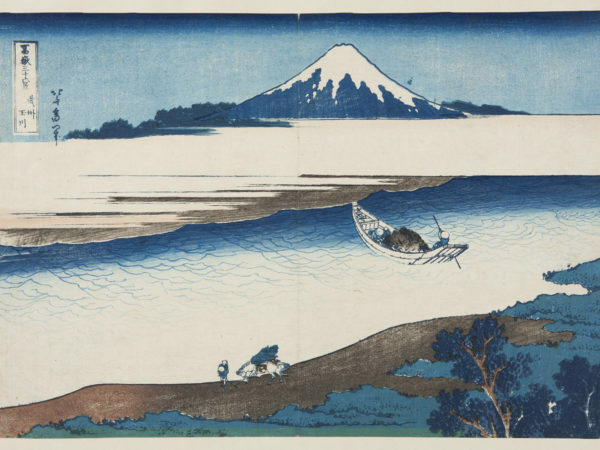 Hiroshige designed this print series soon after the publication of Hokusai’s Thirty-six Views of Mount Fuji, using the same landscape format which had proved popular with buyers of Hokusai’s prints. 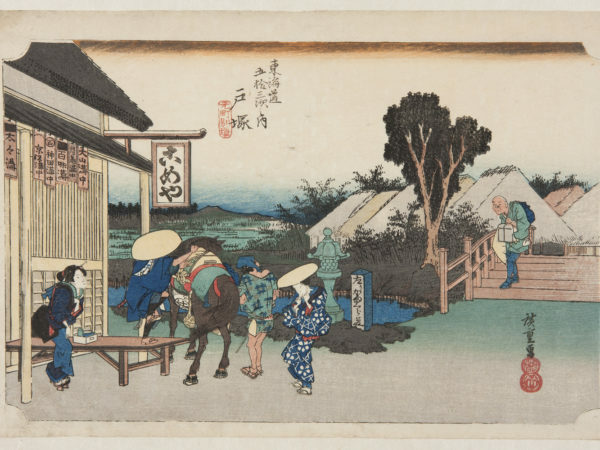 A traveller is mounting his horse outside this inn. 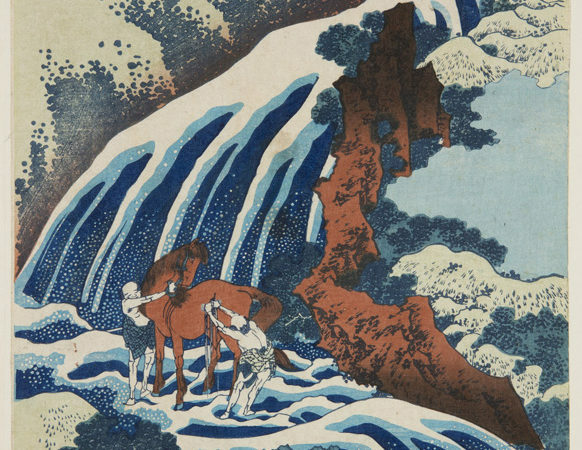 Only wealthy travellers could afford to travel on horseback. They changed to fresh horses at different stopping places along the road. Poorer travellers walked, sometimes for hundreds of miles. The road zig-zags through a marshy area, creating a sense of depth and distance. 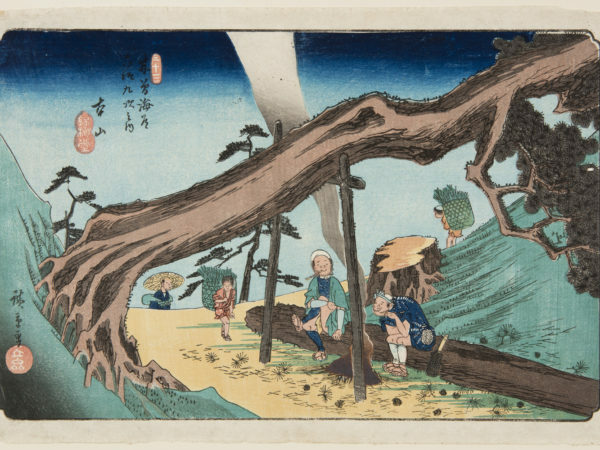 Almost hidden by a tree, a delivery man runs by some other travellers. Japan’s military dictator, the Shōgun, decreed that the lords who owned the stopping places on the road had to make sure there were always runners ready to deliver messages and goods. 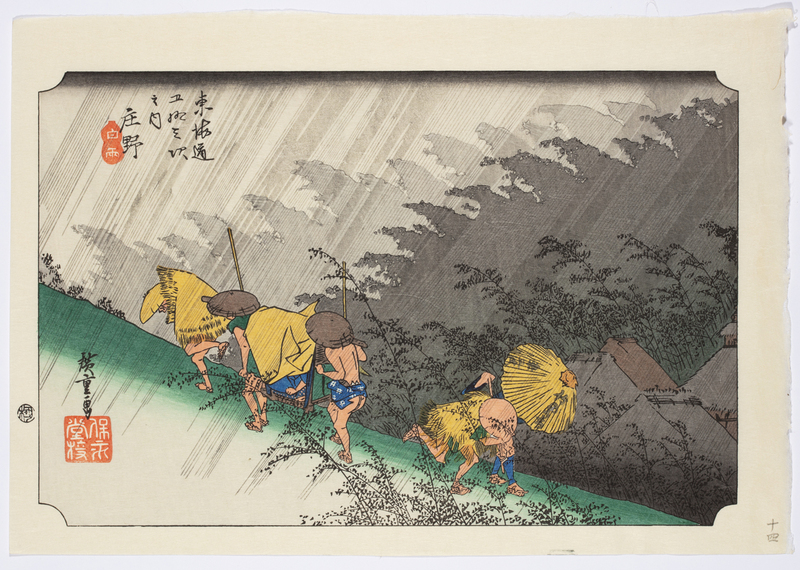 Travellers arriving at the town of Ōiso protect themselves against the heavy rain under a black and yellow sky. 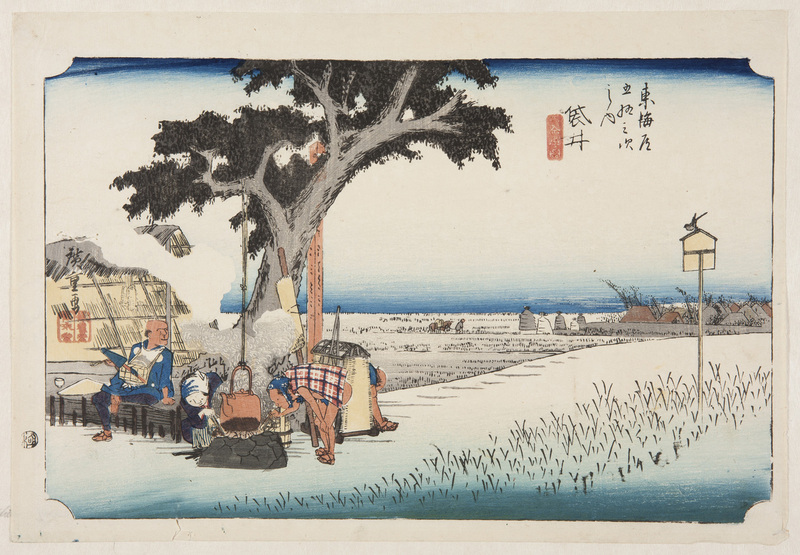 In the fields there are stacks of straw from the rice harvest. Tora, mentioned in the title, refers to a woman called Tora Gozen who lived in Ōiso over 800 years ago. A legend said that she turned into stone after the death of her lover and that the stone cried every year on the anniversary of his death, the 28th day of the fifth month. 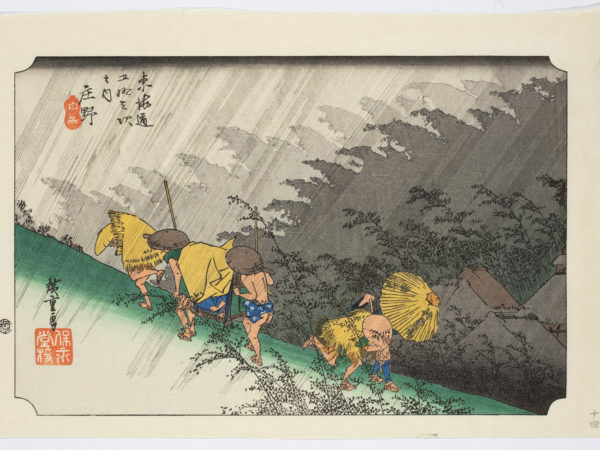 Hiroshige and the craftsmen who printed his designs were masters at depicting different weather conditions. One can barely make out the archway at the entrance of the Shinto temple on the right, or some of the travellers, through the morning mist. 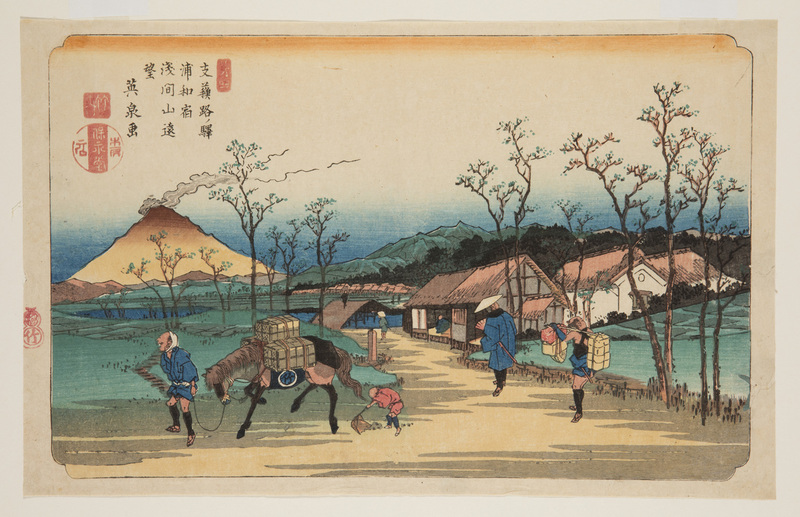 We follow behind a horse clip-clopping along carrying two adults and a child who looks over to Mount Fuji. On either side of the road rice is growing in paddy fields. 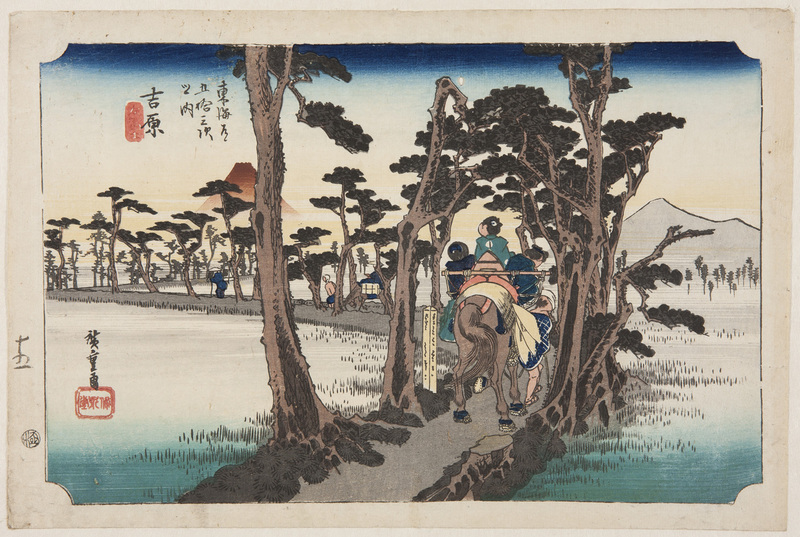 The travellers and trees decrease in size as the road zig-zags into the distance, giving depth to the image. 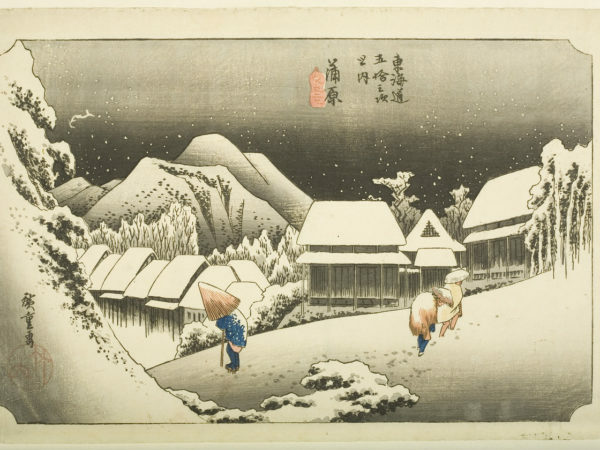 Travellers trudge through deep snow, huddled against the cold, with bare legs and little protection from their clothing. 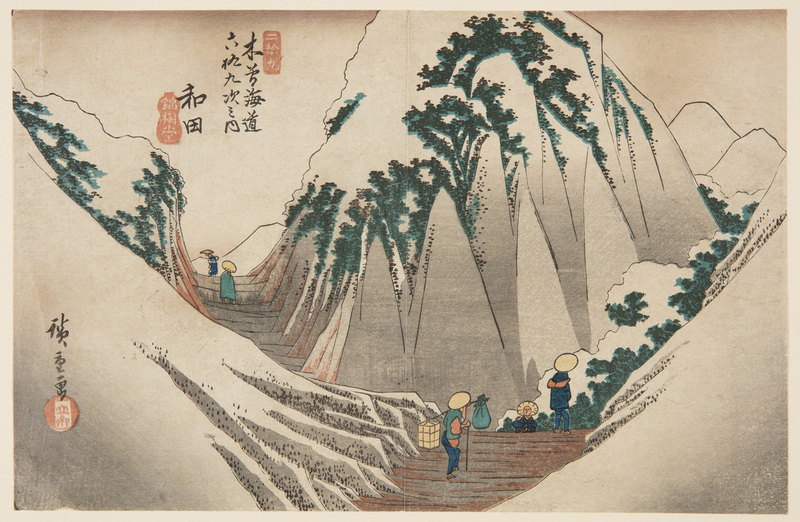 The printer of the image has given volume to the snowy slopes and peaks by carefully applying grey ink onto the block used for printing the grey details. 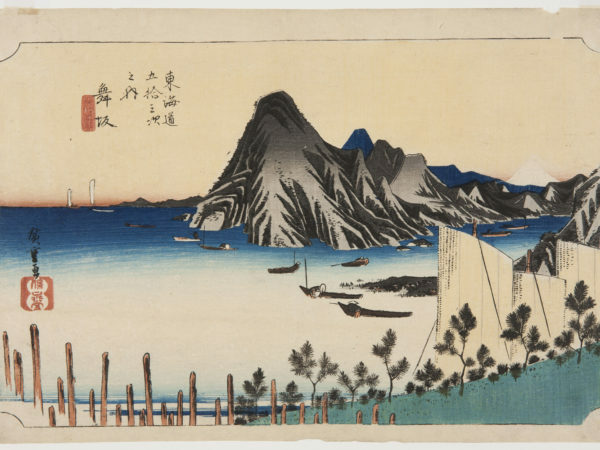 The sharp angles of the cliffs and the windblown pines contrast with the pure conical form of Mount Fuji in the distance and with the flat expanse of the sea. The travellers on the cliff road are dwarfed by the landscape around them. In this dramatic view, the road is shown from a high vantage point. The legs of three of the travellers cannot be seen which makes the path look even steeper and narrower. At the stopping places along the Tōkaidō route, people could hire porters or horses to take them and their goods from stage to stage. 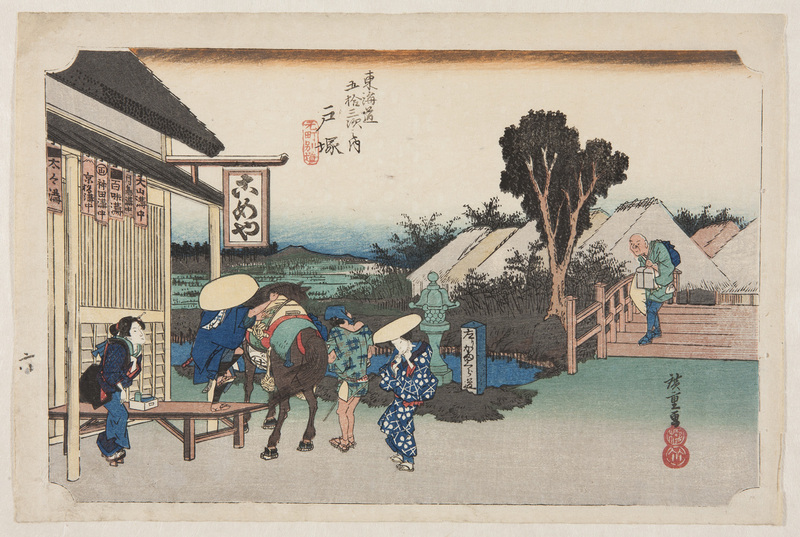 Here Hiroshige presents us with a glimpse of one of these stations, with stretching porters and two horses. 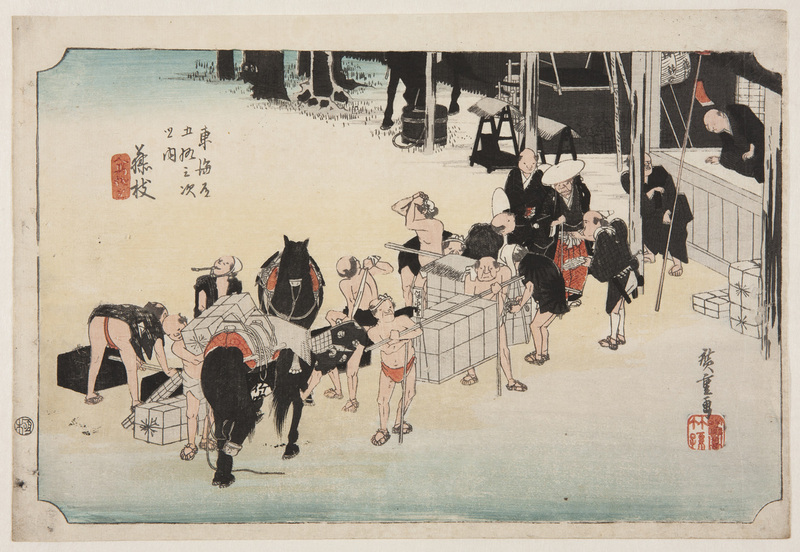 He shows the contrast between the merchant in his formal clothes and the porters in loin cloths and sandals. 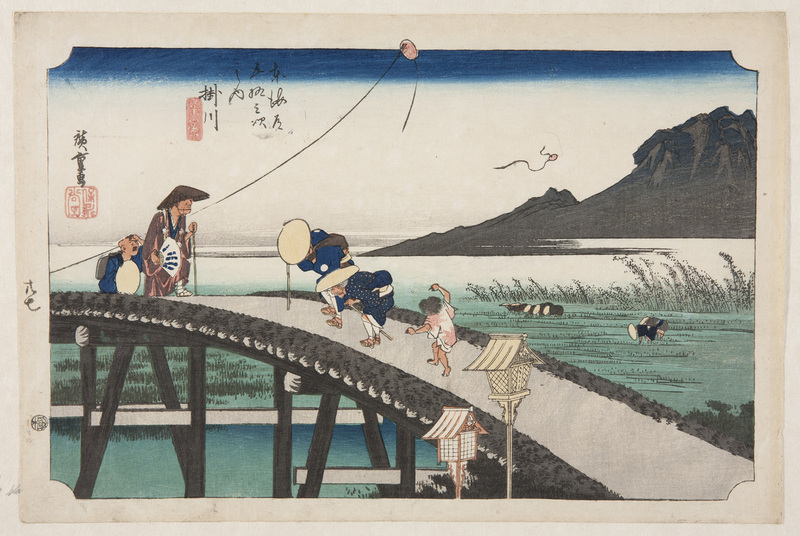 The man on the left sweats as he climbs the steep bridge. We can almost feel the wind that blows the kites into the air, but who is holding the kite string? And who has lost his kite? 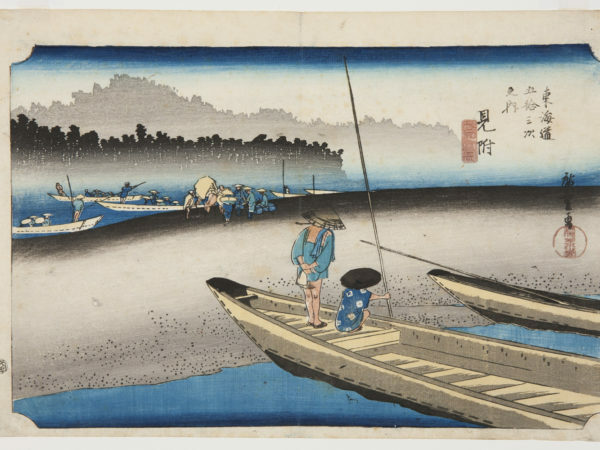 Hiroshige was a master at involving viewers in his scenes through his depictions of human activity, times of day and weather. A traveller stops for a welcome cup of tea at an outdoor tea stall. To the right one porter bends to light his tobacco pipe in the fire, and another sits down, exhausted, on his back-pack. Ferrymen are ready to punt passengers across the river. 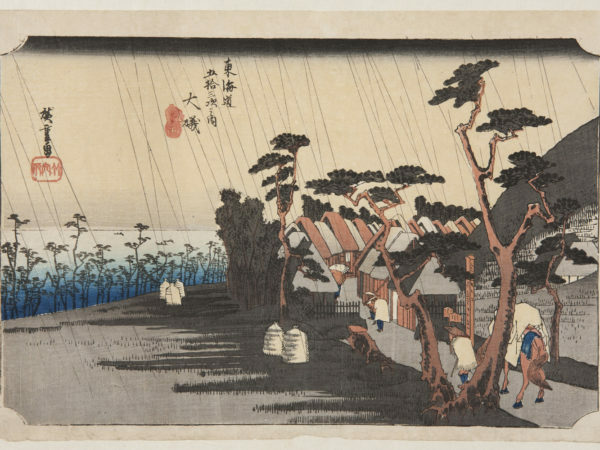 The lines of trees in the distance are printed to evoke mist. 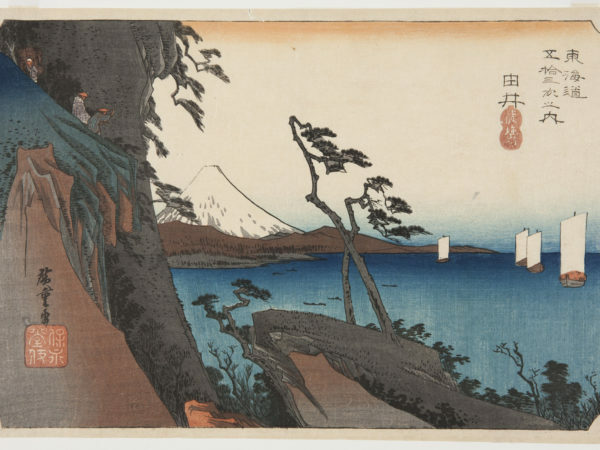 The lines of fence poles and young pine trees lead our eyes round to the right, past the sails below to other boats in the inlet. The inlet was once a lake but an earthquake and tidal wave in 1499 washed away the land separating it from the sea. Imagiri means ‘now broken’. marked with circular symbols, the lord’s family crest. Daimyō and their followers had to make regular trips to the capital city, Edo (now called Tokyo), to show their allegiance to the military dictator (Shōgun). 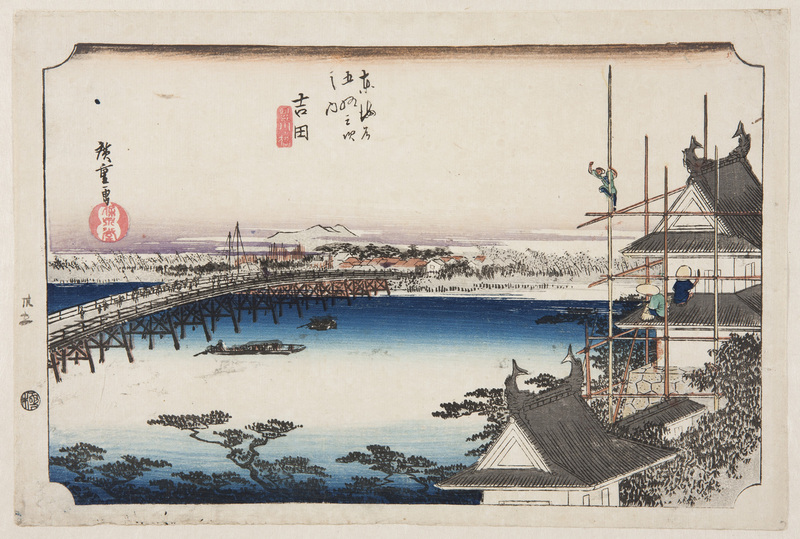 A workman looks out across the river from the top of scaffolding on Yoshida Castle. 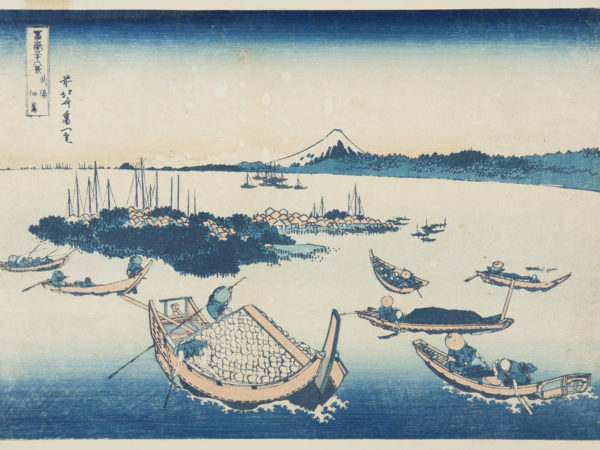 The printer of this image has carefully applied the blue ink to the woodblock before printing from it to give the impression of light shining off the water. 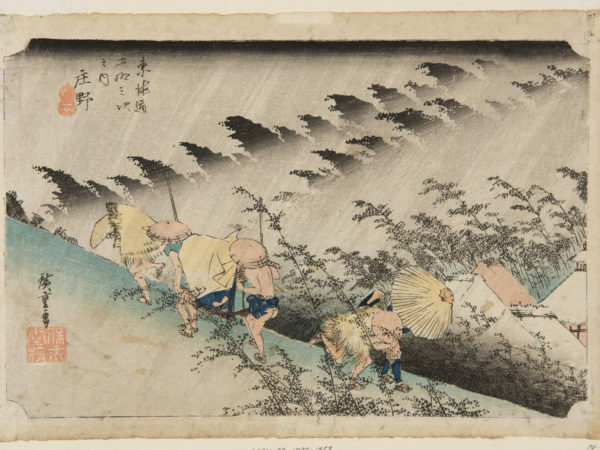 People rush for cover during a rainstorm, including two men carrying a passenger in a sedan chair. 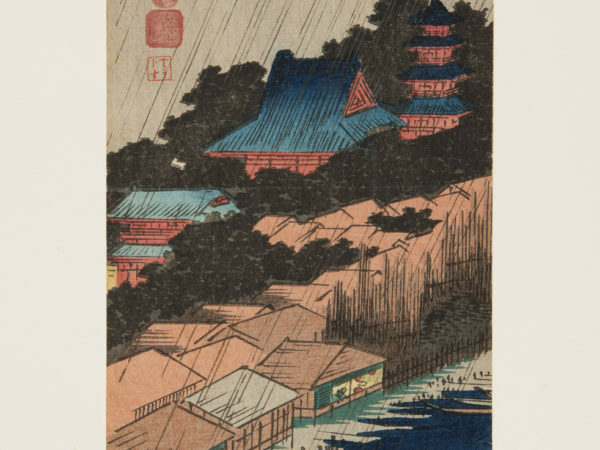 The strong diagonal lines of the rain slanting one way and the trees and road the other, give a hectic mood to the scene. 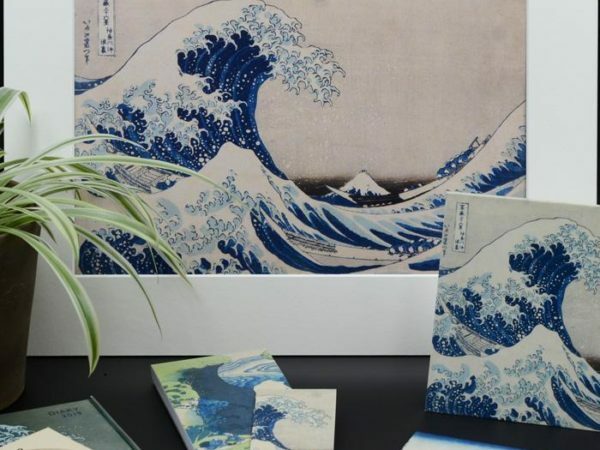 A set of reproduction prints showing the different stages of printing this design is in a case nearby. Commissioned from the workshop of Yuji and Jiro Nagao, Tokyo. The first tage of printing is the ‘key block’, the black (or sometimes blue) outline. Ink is applied to the wooden block then a piece of paper is rubbed down onto it, transferring the ink. 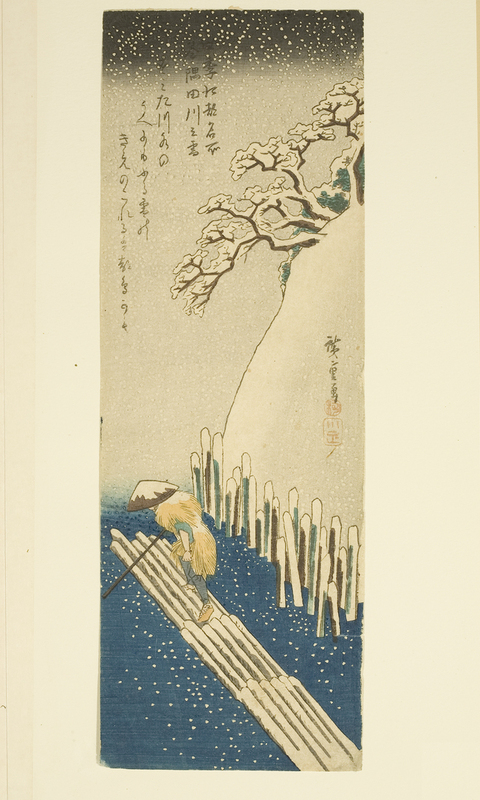 A separate woodblock is inked up for each successive colour. The design here was printed fourteen times to achieve the end result. 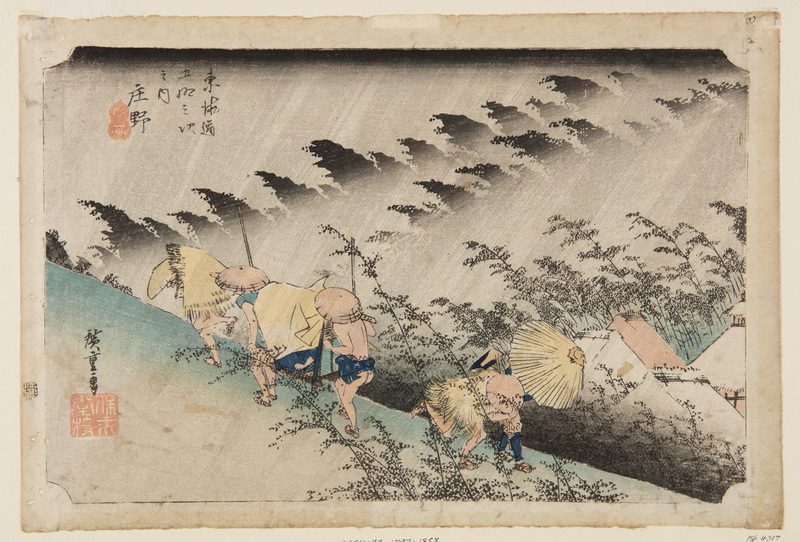 from the series Famous Views of Edo in the Four Seasons. 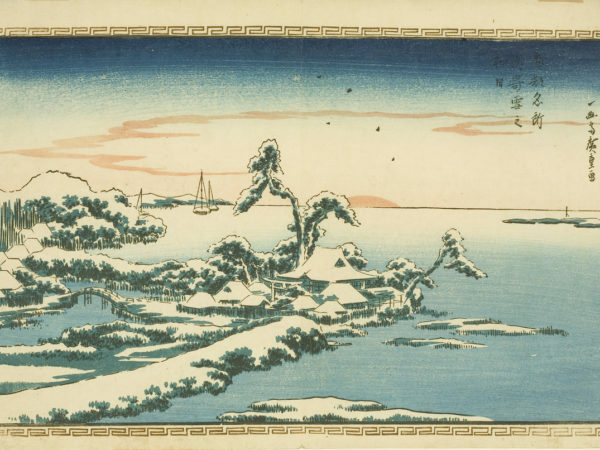 Hiroshige designed a number of landscapes in this narrow, vertical format. 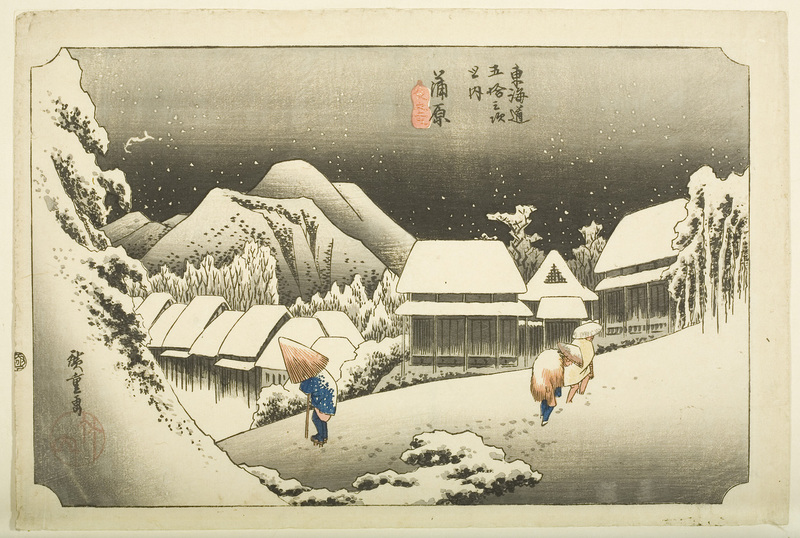 The snowflakes here were formed by cutting marks with a chisel into the woodblock used to create the background. – Or could they be seagulls? 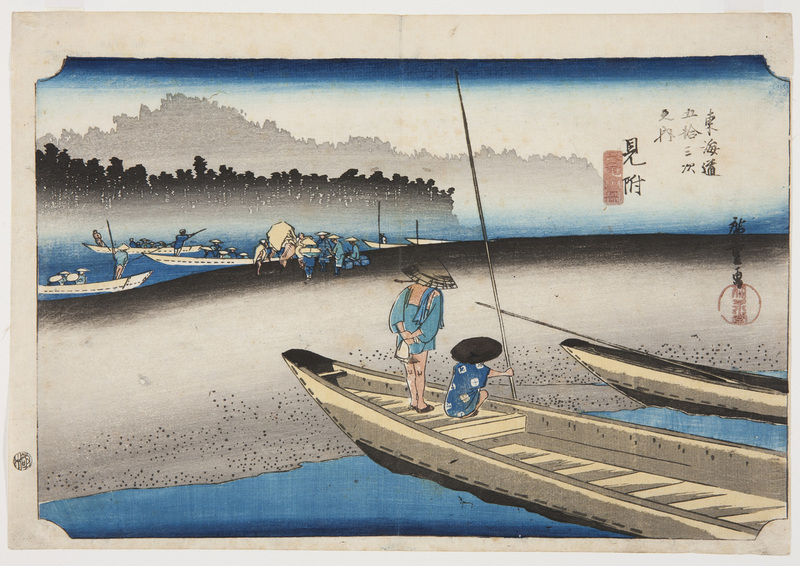 Hiroshige became known for his many designs of famous places in the capital city Edo (Tokyo). 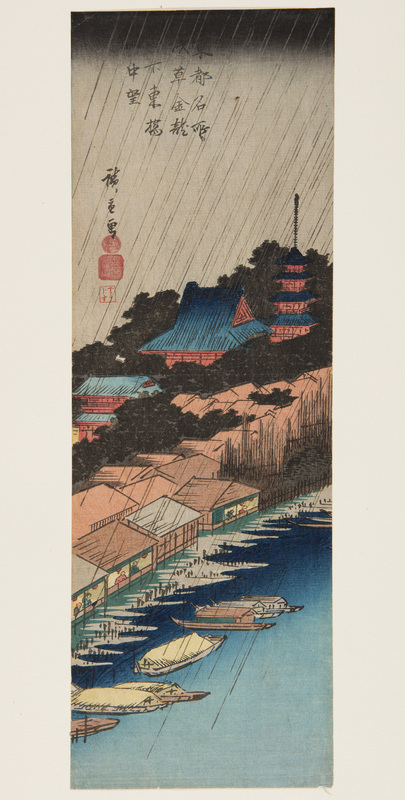 He depicted landmarks in different seasons and weather conditions, such as this five-storey pagoda in a temple at Asakusa in heavy rain. 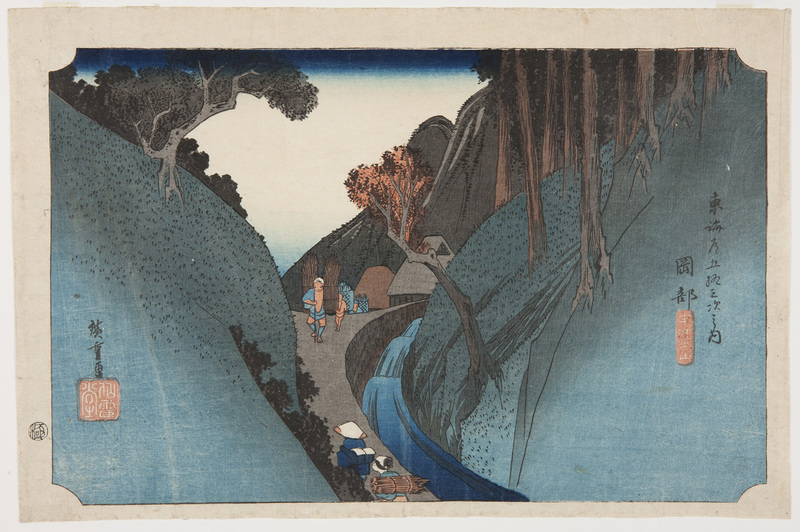 from the series The Sixty-nine Stations of the Kisokaidō Road. 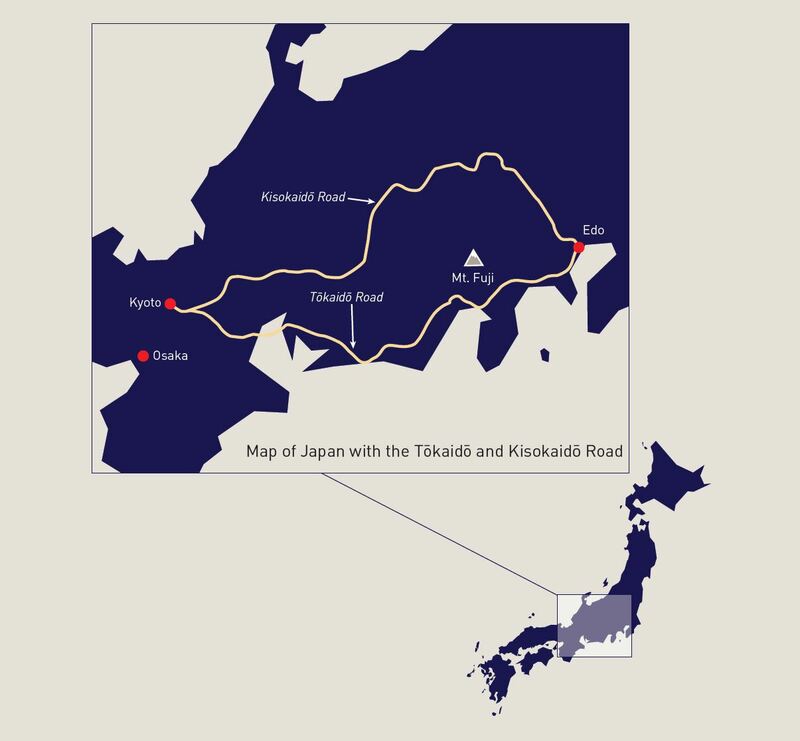 The inland road between the capital city Edo (Tokyo) and Kyoto was called the Kisokaidō. It was longer and more mountainous than the coastal route. 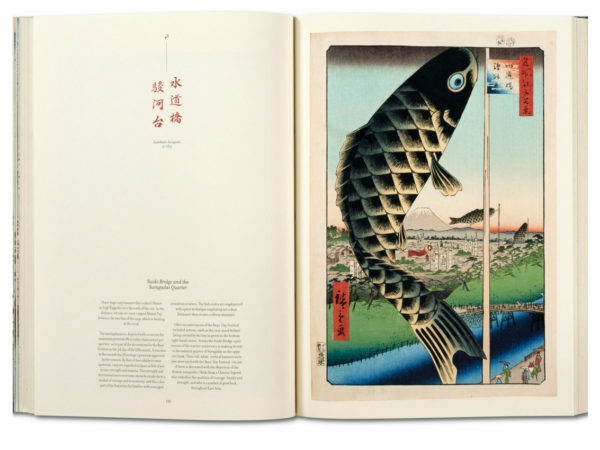 The artist Keisai Eisen collaborated with Hiroshige to produce 23 of the 70 designs in this series. 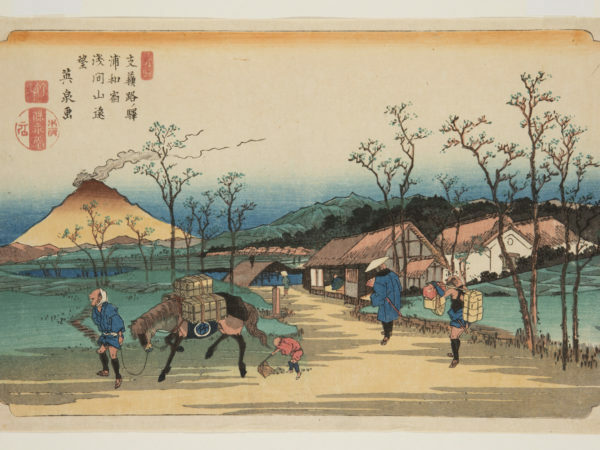 In this view a small boy collects horse droppings to use as fertiliser on the fields. 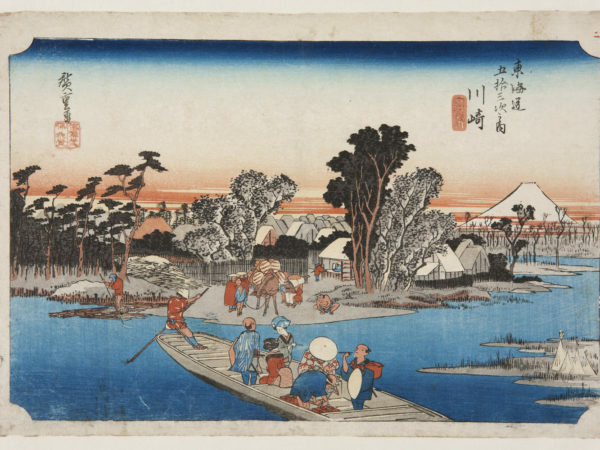 The publisher’s advertisement for the Kisokaidō prints described them as ‘a series of naturalistic views with landscapes and people’. 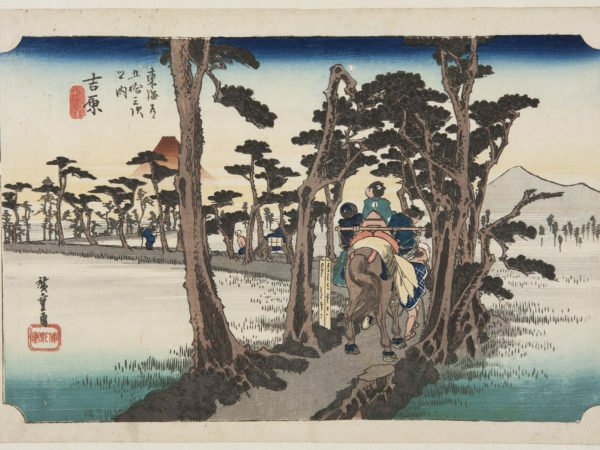 Eisen depicts people, such as the traveller coming towards us, in a lively way. 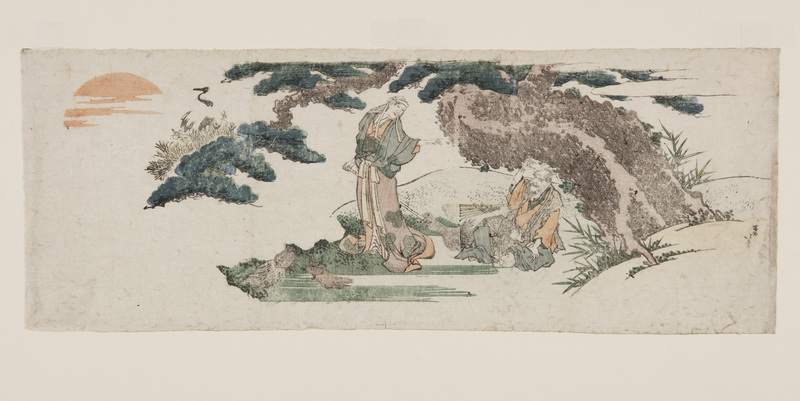 The man to his left in white robes is a Zen Buddhist monk from the Fuke sect, wearing a basket hood over his head to symbolise his lack of ego. There is a pink glow on the horizon. It is either dawn or dusk. Some of the travellers wear straw coats to protect themselves against the cold weather. 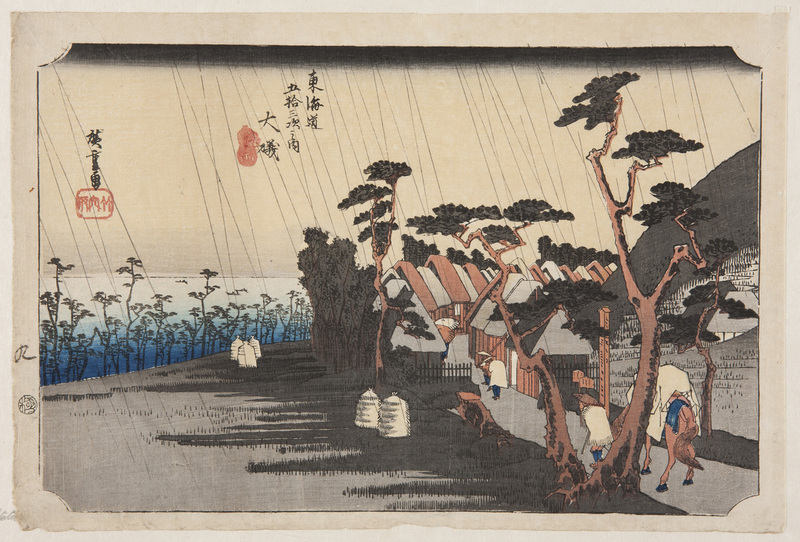 In this version of Eisen’s print, the sky is greyer, showing the different effects that could be achieved by printers using the same blocks. Here it looks as if it might snow again. 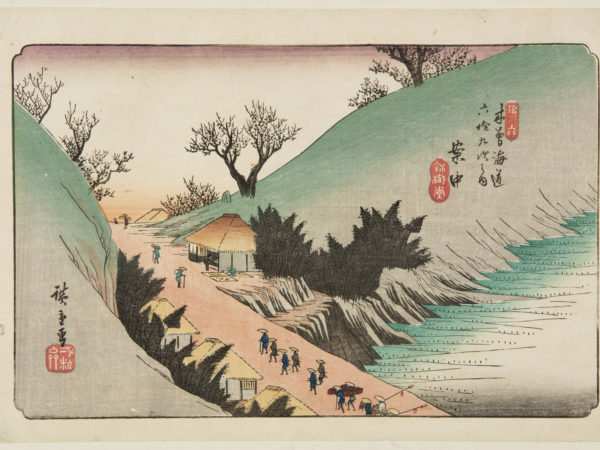 This view looks down onto a procession of followers of a powerful feudal lord (daimyō) passing through a valley. 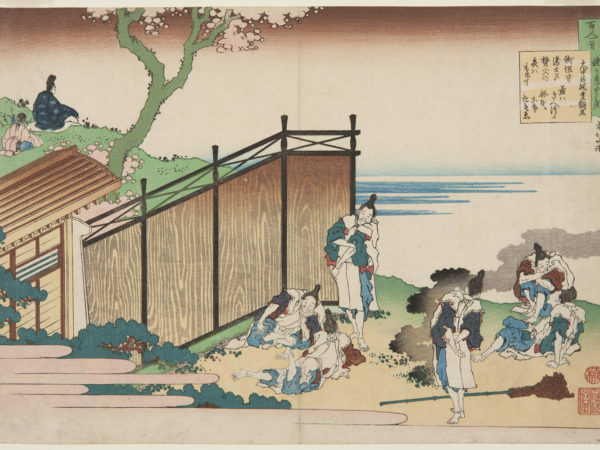 A woman is drying something, possibly plums, outside one of the thatched rest houses. 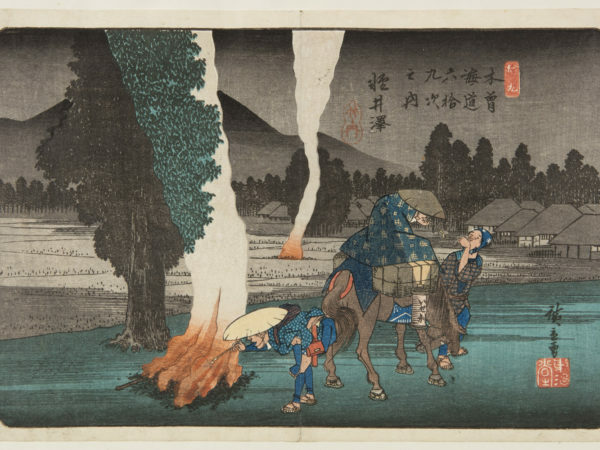 The traveller on horseback gets a light for his tobacco pipe from a passer-by, whilst his servant lights his pipe from a fire on the road. 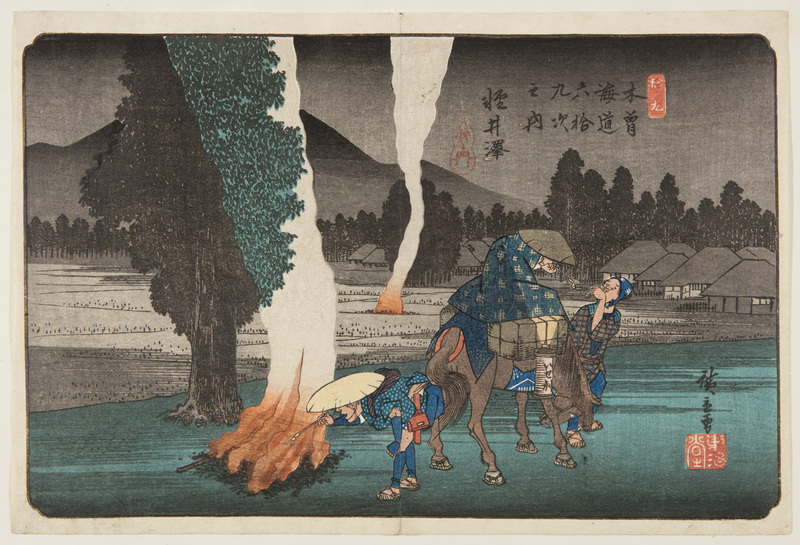 The lantern on the horse and the fires light the darkness dramatically. In Japan, after the harvest, rice stubble was burnt in the fields whilst waste rice straw and husks might be burnt on the road to reduce the risk of fire spreading to wooden buildings. 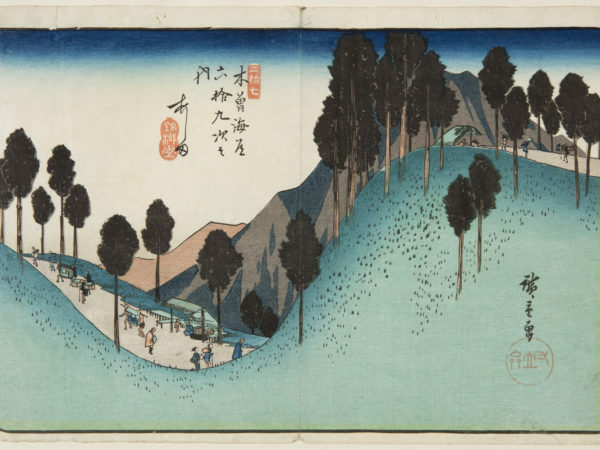 The people look tiny against the strong curves of this hill emphasising the distance they have to travel. 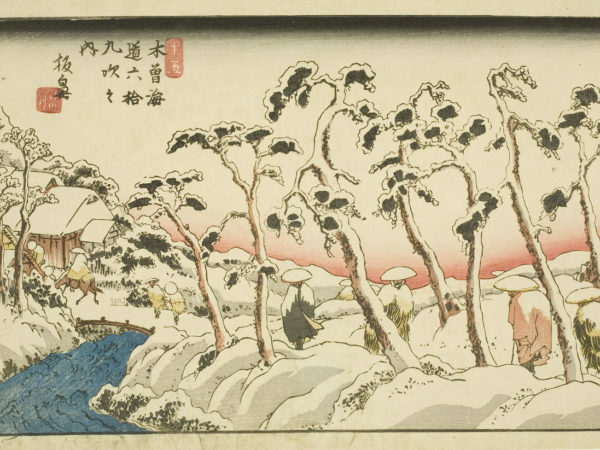 Hiroshige has simplified the land and trees to basic blocks of colour. 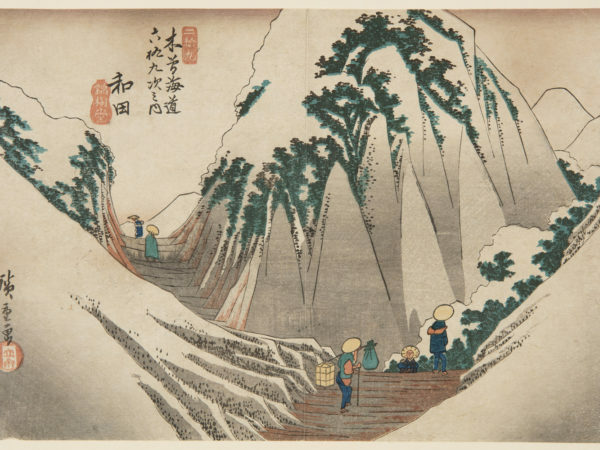 The mountain pass at Wada village was considered the most difficult and dangerous part of the journey along the Kisokaidō route. 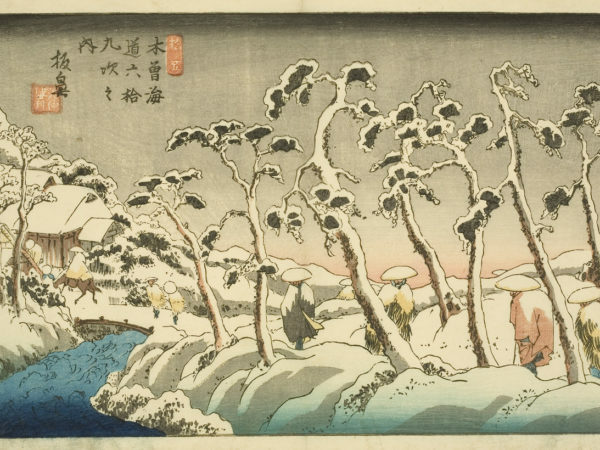 Hiroshige has exaggerated the steepness of the snow-covered slopes in this spectacular design. A huge old pine tree is propped up over the road. 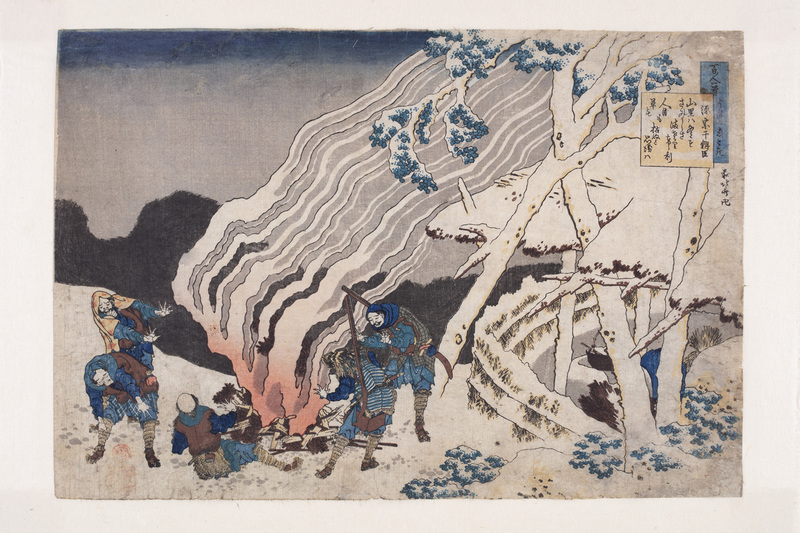 Two wood cutters are resting by a bonfire after felling another tree. Timber was the main industry of mountain areas such as this, centrally controlled by the shogunate, the government of the Shōgun (military dictator). 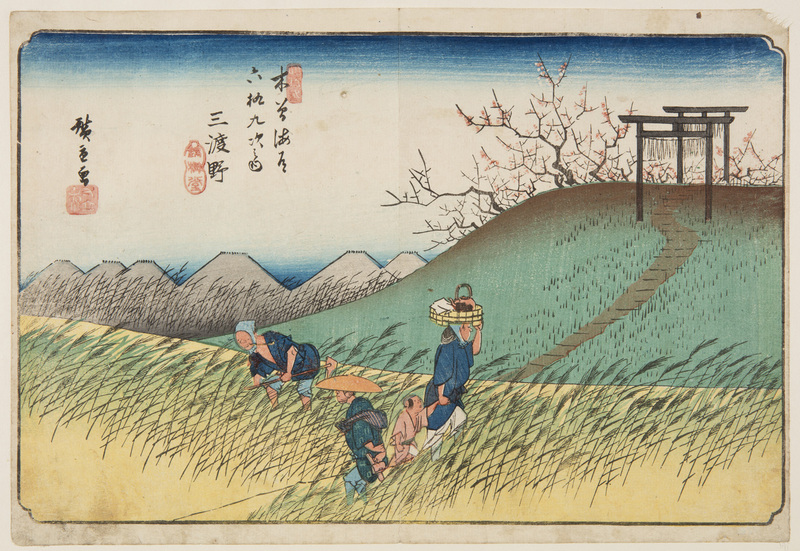 A path leads through a field of crops up towards the arches of a Shinto shrine. 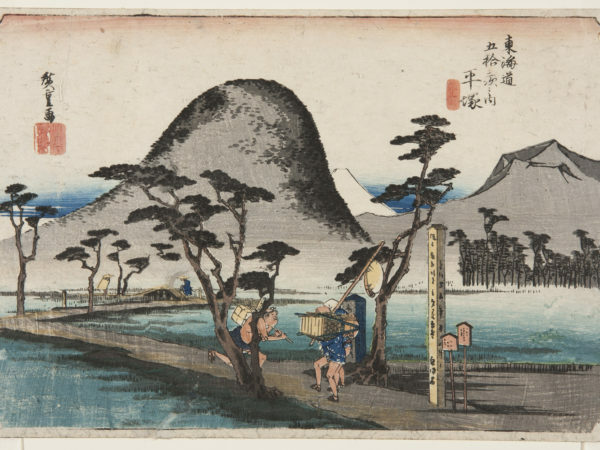 It is a spring day and a woman is taking refreshments to someone, pulling a child along behind her as she passes a traveller going in the opposite direction. 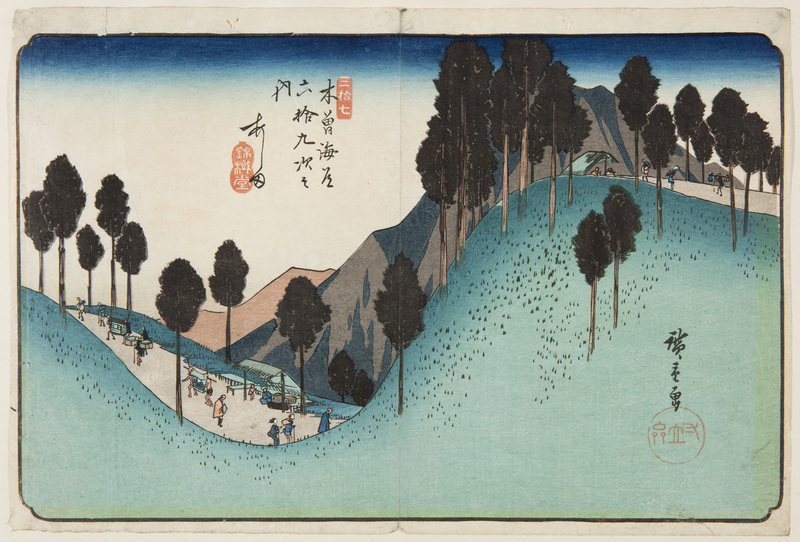 On this mountainous section of road, the travellers include a porter carrying a load, and a white-clad Buddhist pilgrim with a portable shrine on his back. 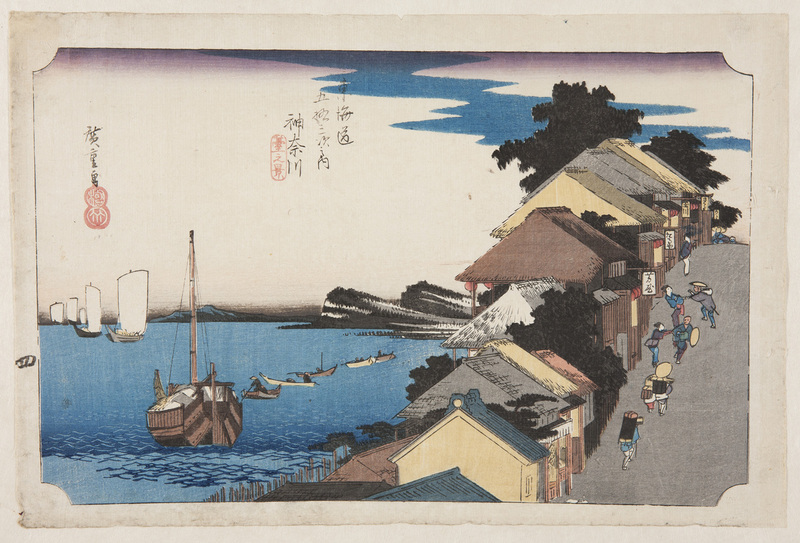 from the series One Hundred Famous Views of Edo. 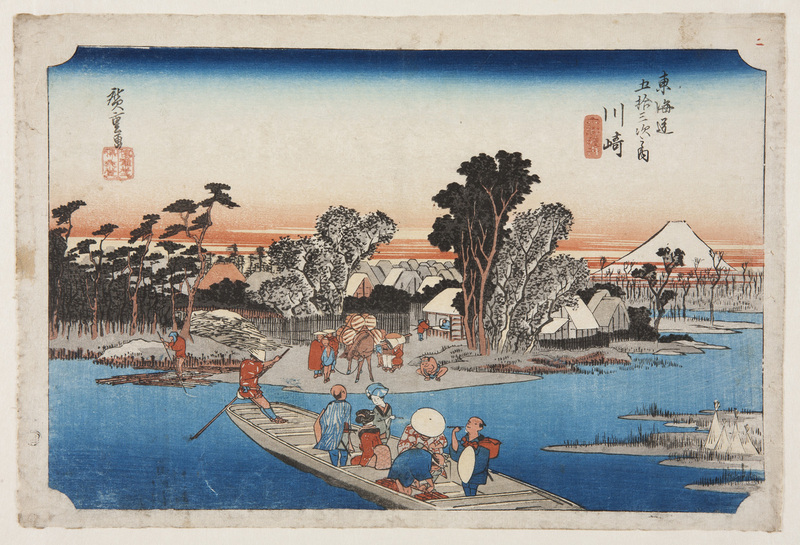 In this series of views of Edo (today’s Tokyo), Hiroshige switched to landscapes in a vertical format. 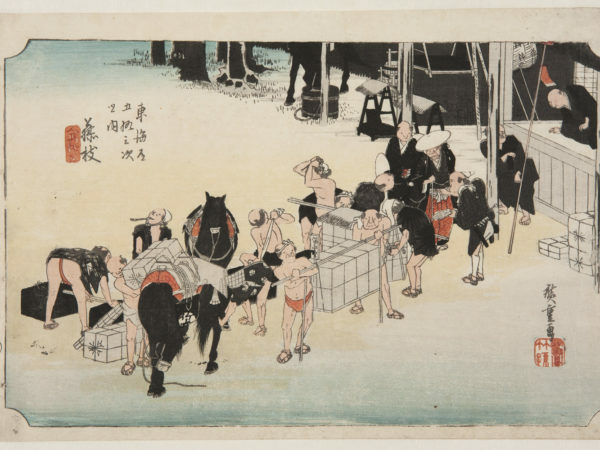 He often shows parts of large objects, people or animals right in the foreground to add more depth to the picture. 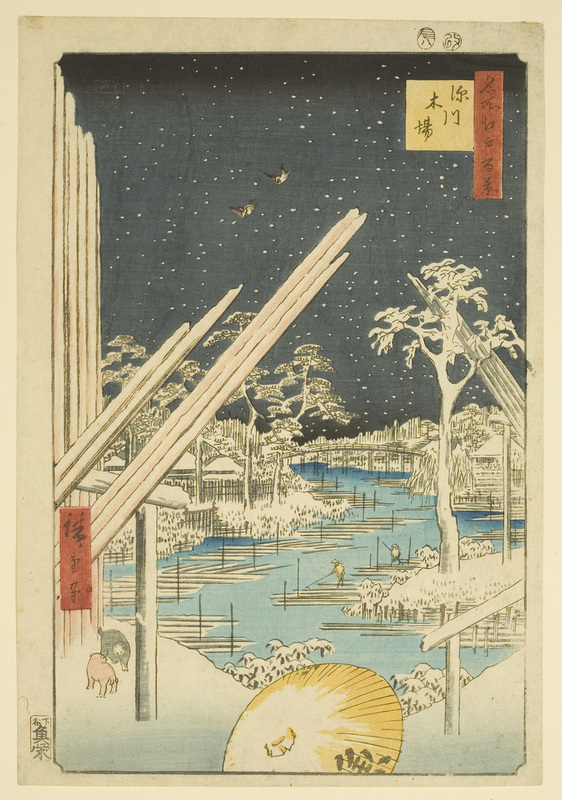 He enjoyed exploring the effects of moonlight, such as here on this snowy timberyard, with logs floating in the river awaiting processing. 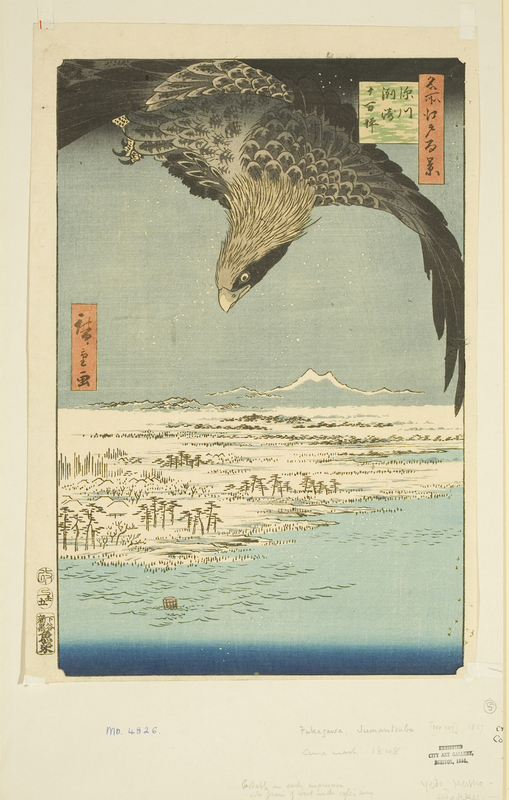 Hiroshige presents us with a breath-taking bird’s-eye view. 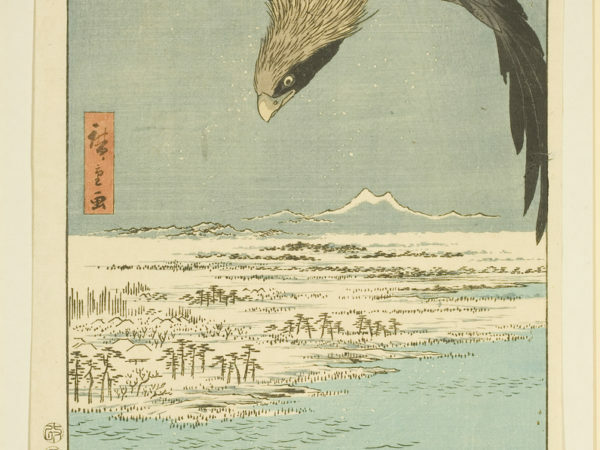 We look down with an eagle over the snow-covered marshes on the outskirts of Edo (Tokyo). 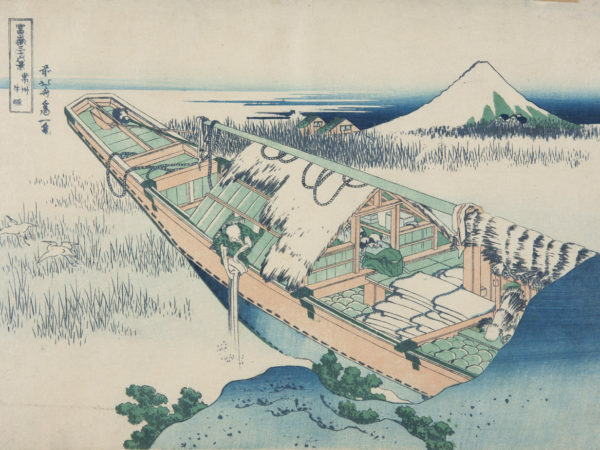 The design shows the artist’s continuing inventiveness as he experiments with unusual compositions. A year later he died of cholera. 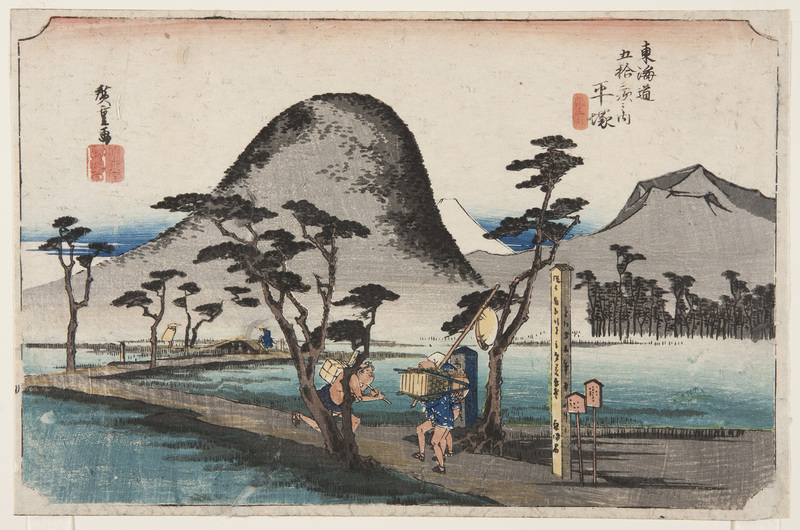 from the series One Hundred Famous Views in the Various Provinces. 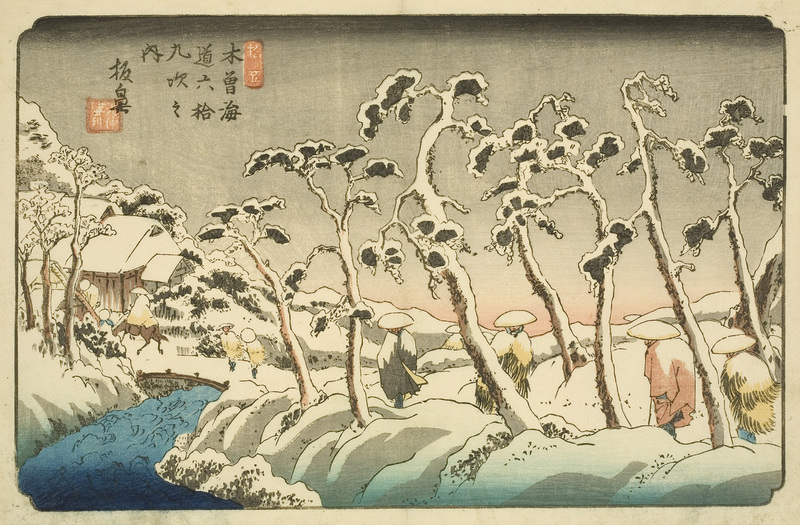 Hiroshige II was a pupil of Hiroshige I, who took on his master’s name after Hiroshige’s death. 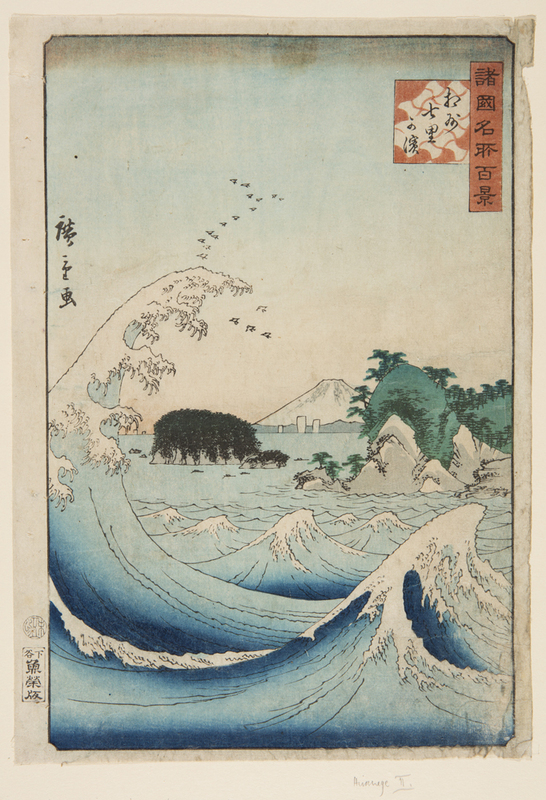 This image, with the large wave in the foreground and the smaller waves echoing the shape of Mount Fuji, shows clear influence from the work of both Hiroshige I and Hokusai. 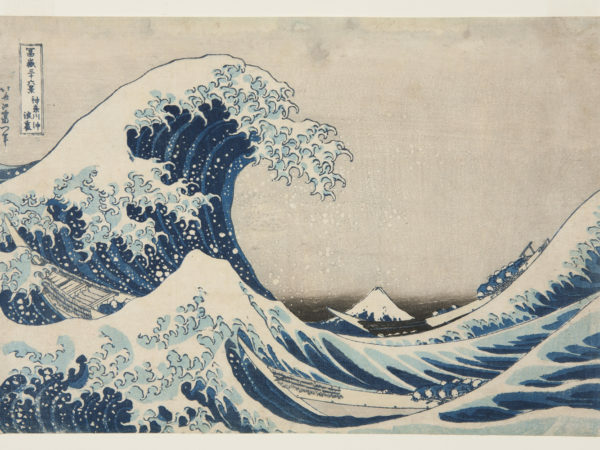 The Great Wave print by Katsushika Hokusai (1760-1849) – one of the best known Japanese artists.